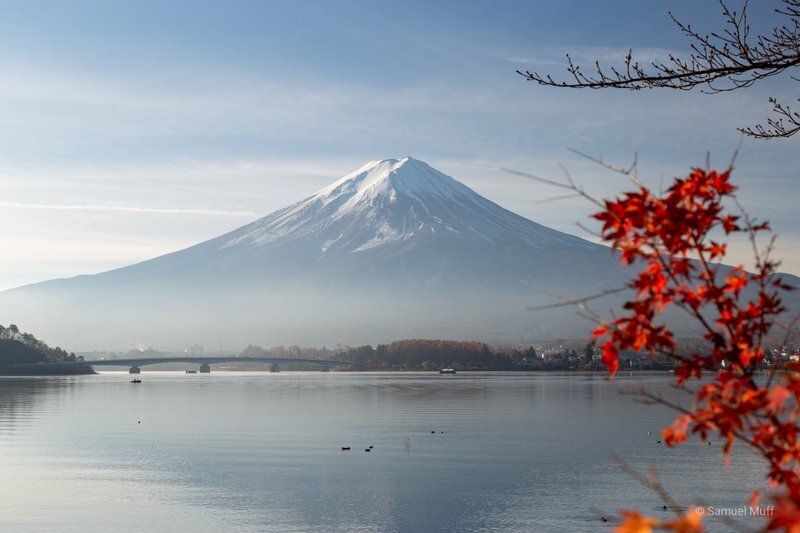 The next item on our Japan agenda was Mount Fuji, probably Japan’s most recognizable symbol. 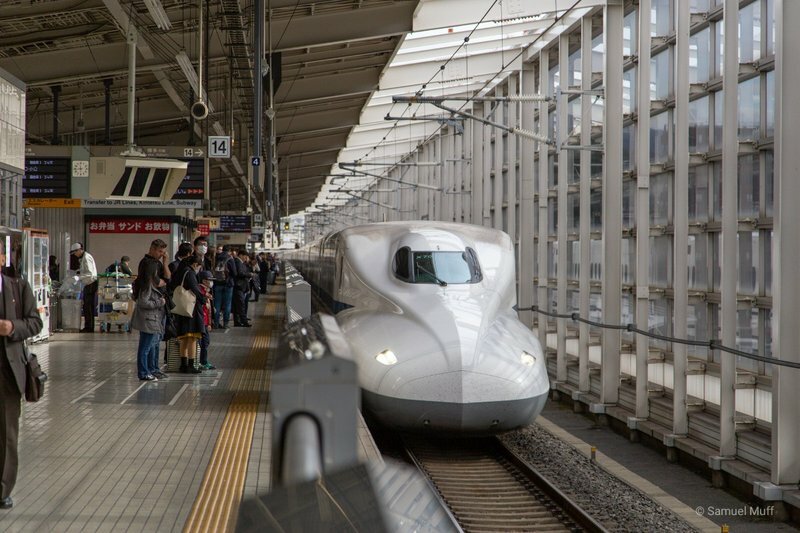 Travelling in Japan is very fast and efficient, as long as you stick to the destinations reachable by Shinkansen. But when veering a bit away from that high speed route, travelling times can get much longer. Getting to our location next to Mount Fuji from Kyoto took more than 5 hours. We stayed in Fujiyoshida in the northeast of the mountain, in a region called Fuji Five Lakes. On the day we arrived, the weather was dark and cloudy and we could not see any part of the mountain. The next day the weather cleared up around us, but not around the mountain. Since climbing Mount Fuji is only possible in summer, we instead hiked around Lake Kawaguchi, one of the Fuji Five Lakes, hoping to see the mountain from there. The 18km hike around the lake was very beautiful and for the most part, devoid of other people, but the mountain remained mostly in clouds. 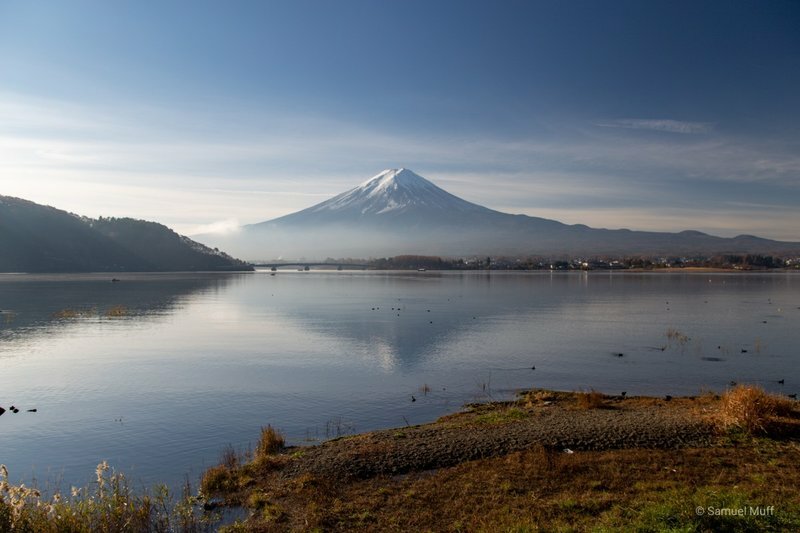 With the strong resolution to see Mount Fuji while we were there, we got up at 6am on the day of our departure and went again to Lake Kawaguchi. 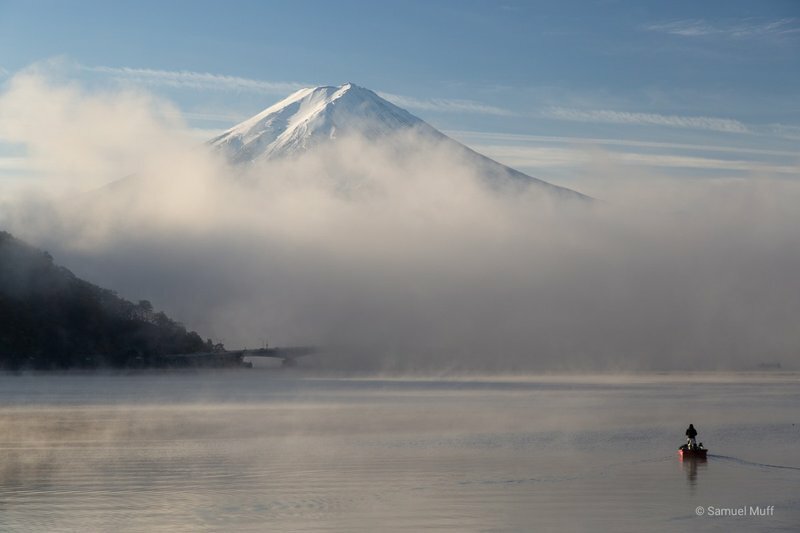 This time, the weather around the mountain was clear, but morning mist was hanging over the lake, obscuring all but the top of Mount Fuji. 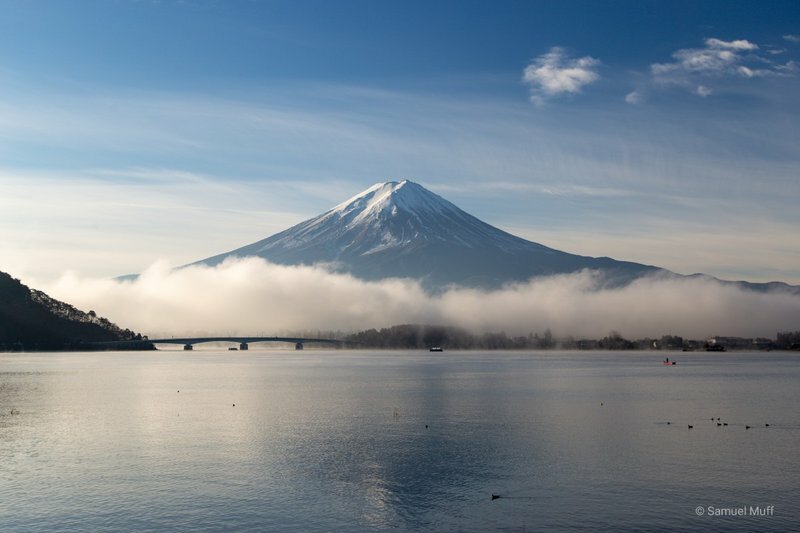 With each minute however, the mist got thinner, until it finally disappeared completely and gave us that perfect view of Mount Fuji we came here for. Our original plan for the four days after Mount Fuji was to rent a car and drive from Kanazawa to Nagano through the Japanese Alps. However, we found out that Sam’s driving license and even his international driver’s license are not accepted in Japan. Interestingly enough, there is some 1949 Geneva Convention on international driving licenses which Switzerland is not part of and therefore their international driver’s license is not accepted. 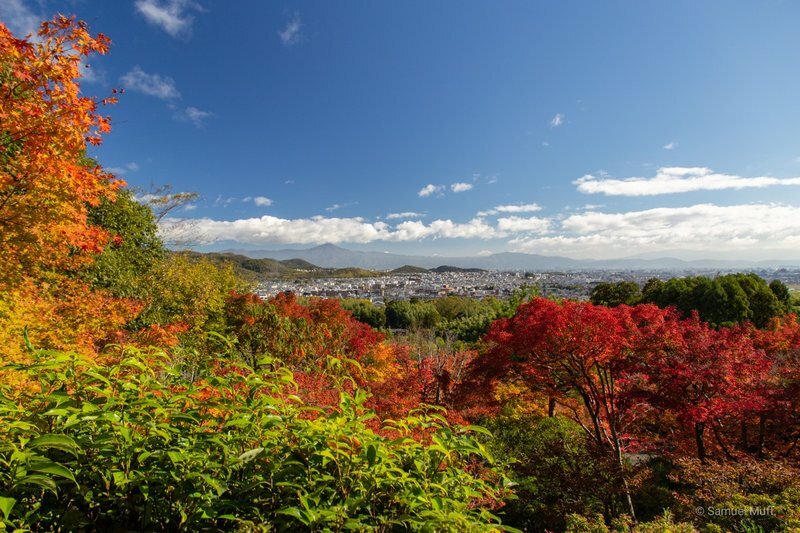 To avoid the complicated process of getting the right to drive in Japan, we dropped this plan and just stayed in Kanazawa and Matsumoto instead. 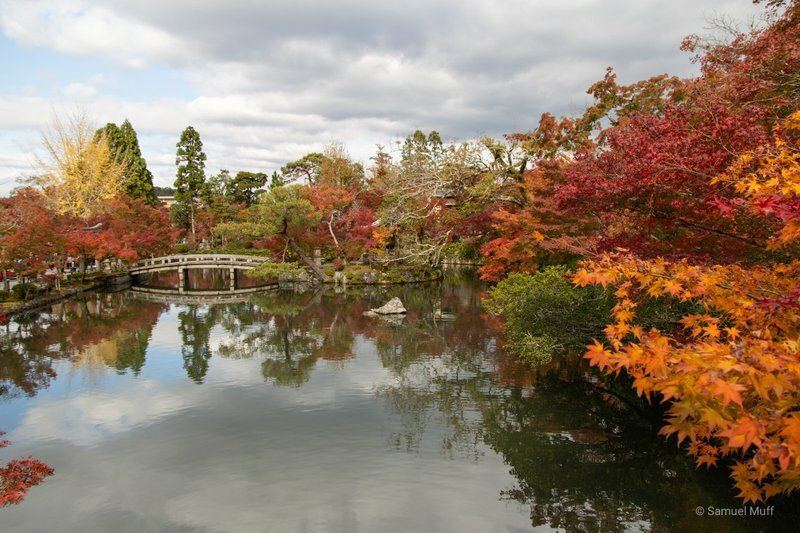 Kanazawa is located to the north of Kyoto at the Sea of Japan. Not so many tourists travel there, but we found it to be a very interesting city. Inside the underpass between the train station and our hotel, there was a grand piano with the note “Please feel free to play”. 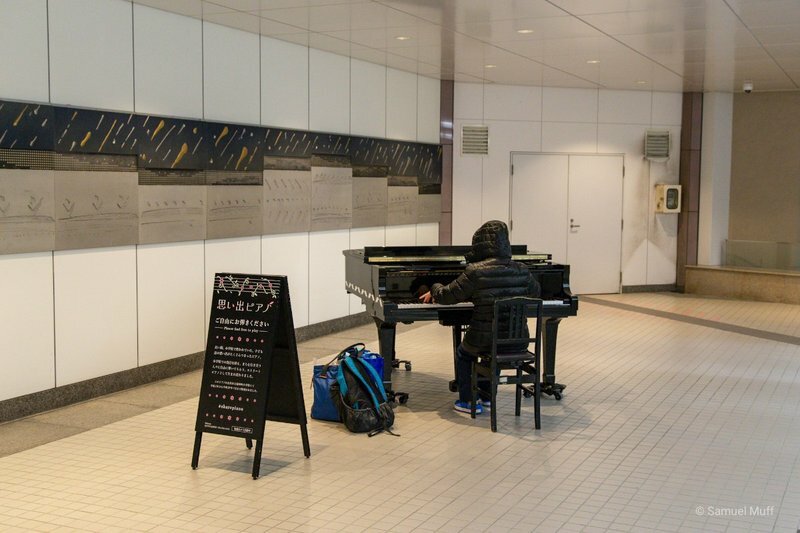 On many occasions we saw a very skilled woman there, playing concert-level piano in her parka. 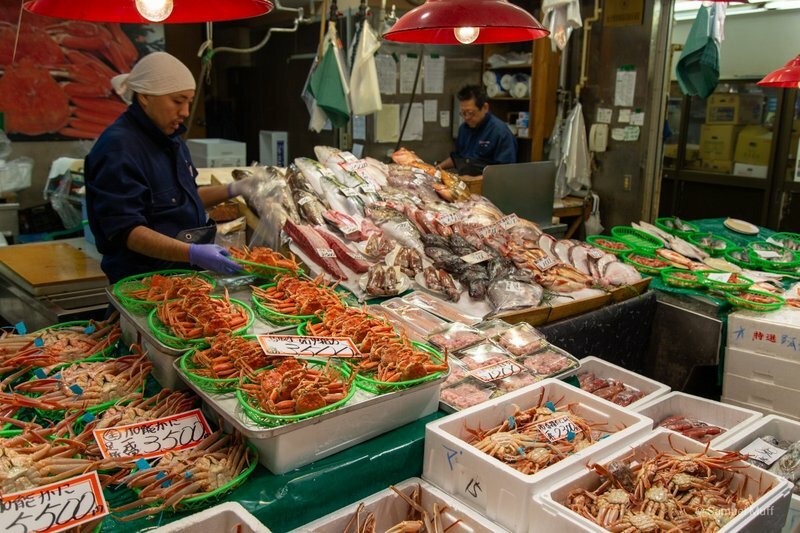 It was raining for most of the day when we were there, so a stop at the local fish market seemed like a good idea. 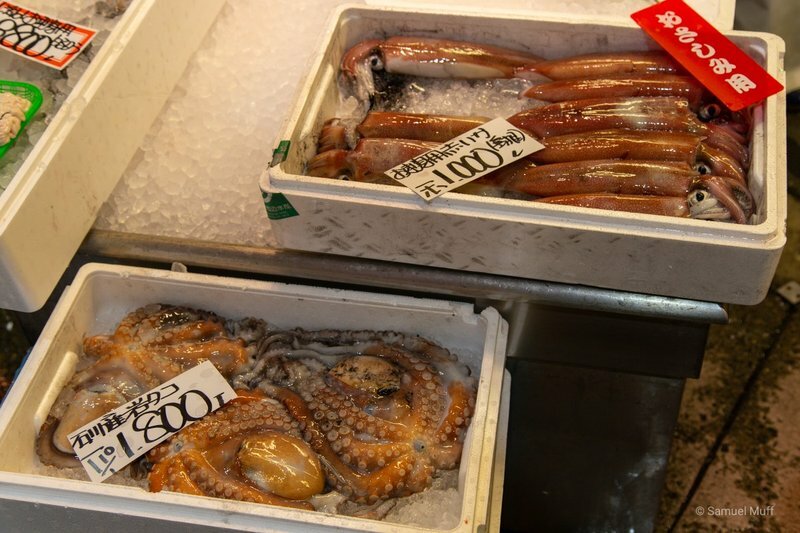 The large amount of raw crabs, shrimps, squid and octopus were an interesting sight, but did not increase our appetite. 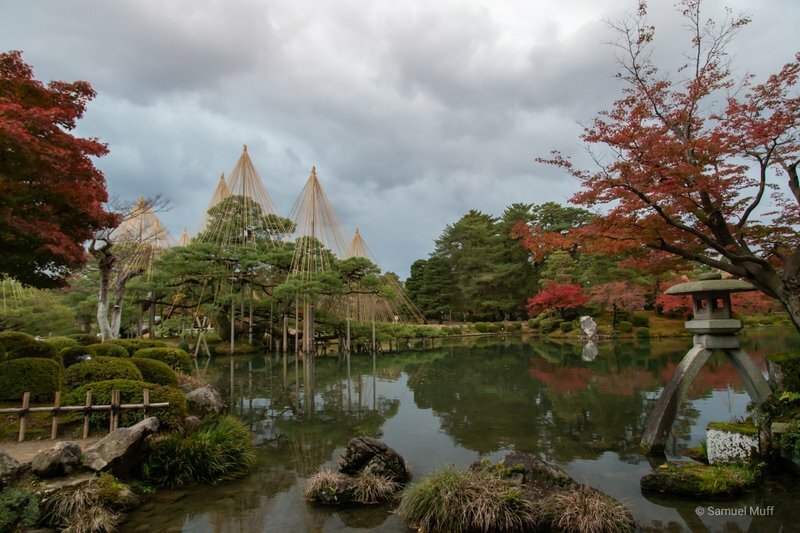 When it cleared up towards the evening, we visited Kenroku-en, one of Japan’s finest gardens. The garden was quite full despite the gloomy weather. Our two days in Matsumoto were part of the Labor Thanksgiving Day weekend in Japan and already weeks in advance, there was almost no room in the city left. 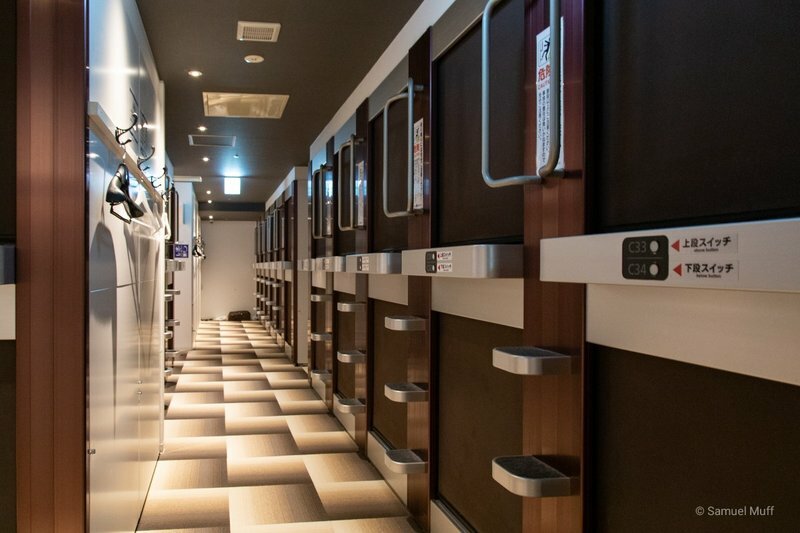 The only option was to stay in a capsule hotel, something we wanted to try anyway while in Japan. The nights in the roughly 1x1x2 meter capsules were not uncomfortable and there was more privacy than you would have in a regular hostel dormitory. But for a honeymoon it is obviously not a great choice and it was the first time since our wedding that we slept in separate rooms. 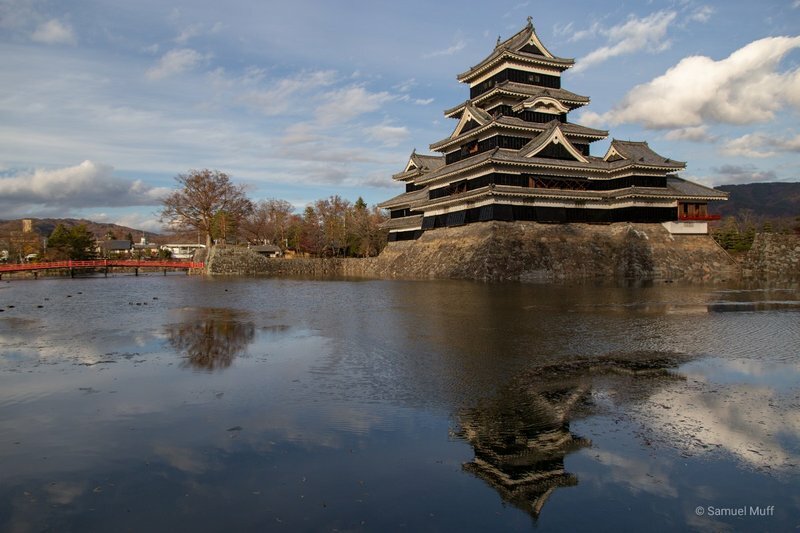 Matsumoto is most famous for its original wooden castle from the 16th century. The castle is still standing because it was never attacked. 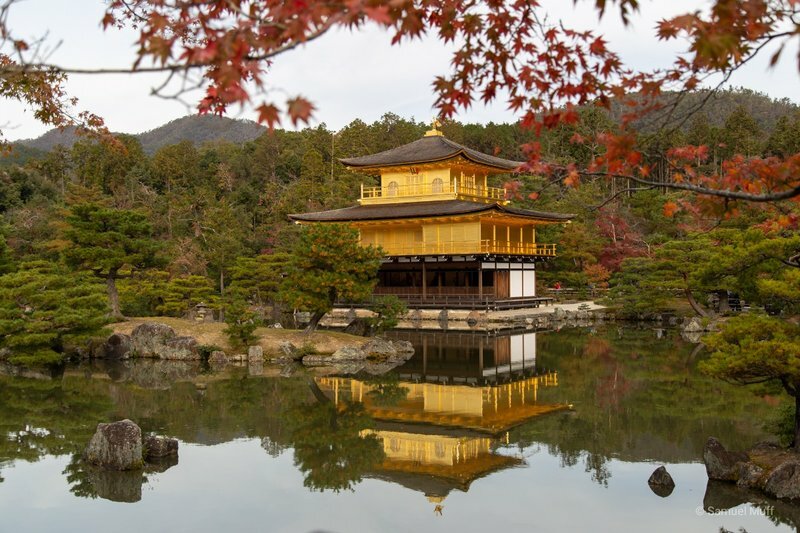 This must have surprised the shogun who built it, since he dedicated an entire floor for his honor preserving suicide in case the castle would fall to the enemy. 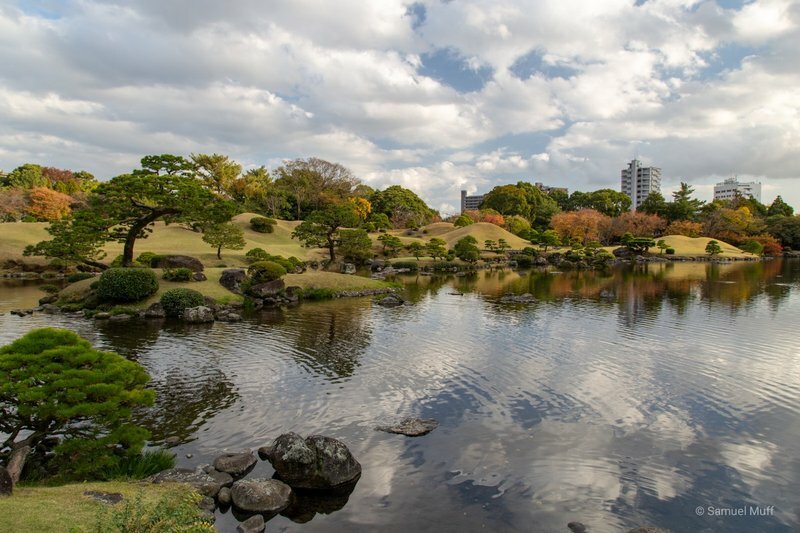 Besides the castle, we also enjoyed the views of the Japanese Alps from the city’s secluded parks. 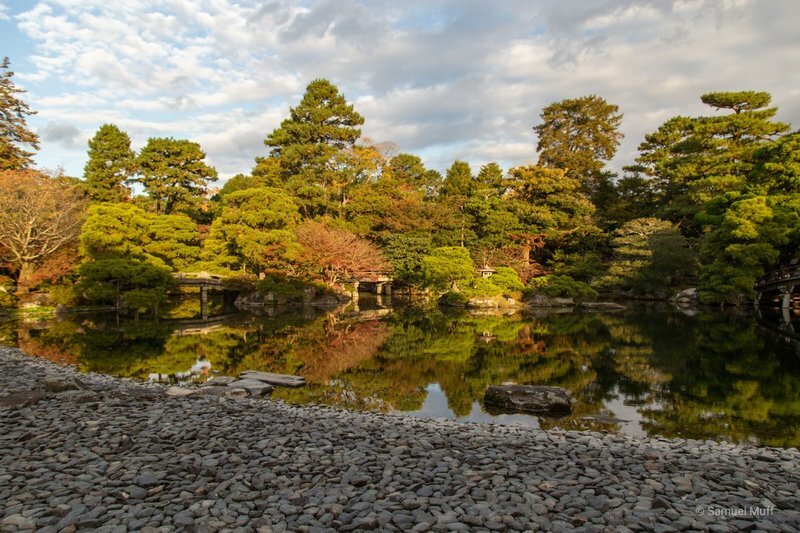 We also had some great culinary experiences in Kanazawa and Matsumoto. In Kanazawa we had the best sushi so far, with tuna and salmon that almost melted in our mouth. Almost equally tender was the Wagyu beef we tried here for the first time. In Matsumoto Sam had his favourite Japanese food so far, a simple bowl of ramen noodles in a broth based on miso paste and pork, topped with ham and ground beef. 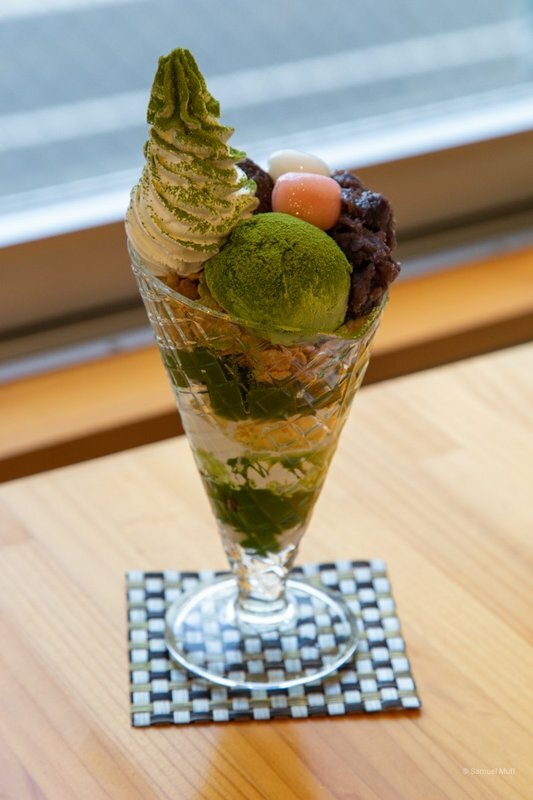 Lastly, the Matcha (powdered green tea, very popular in Japan) parfait we had in Matsumoto was a great combination of different flavors and textures. 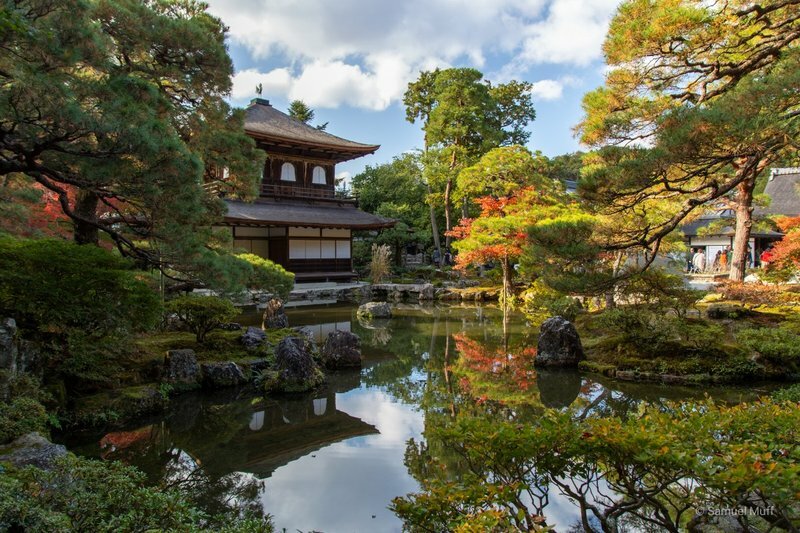 After Hiroshima, we headed east towards Kyoto, the cultural capital of Japan. 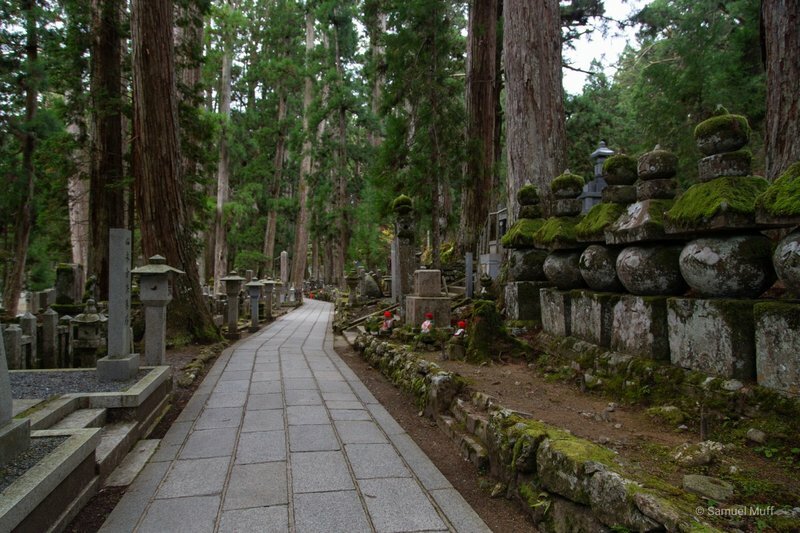 But before Kyoto, we did a little detour to Koya-san, a mountainous village mostly consisting of Buddhist temples. 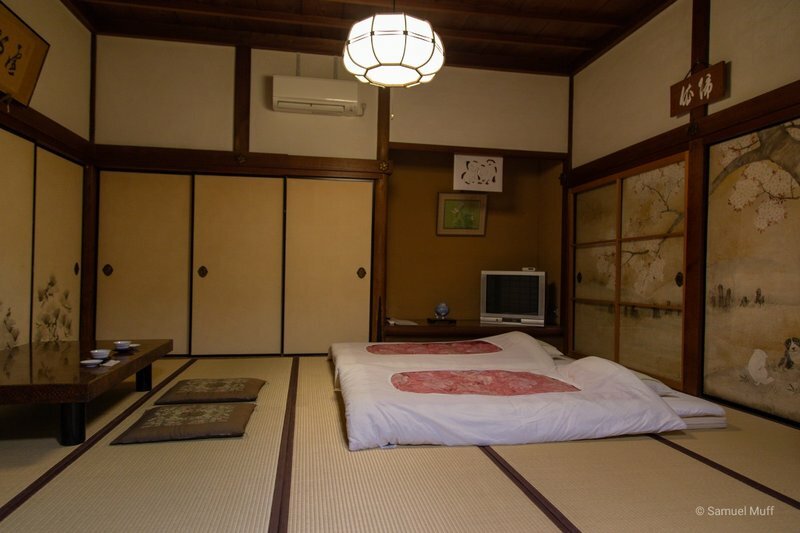 There we stayed a night in a traditional Japanese room in one of those temples. For dinner, the monks prepared for us a delicious meal of Shojin-ryori, which is essentially kaiseki without meat or fish. 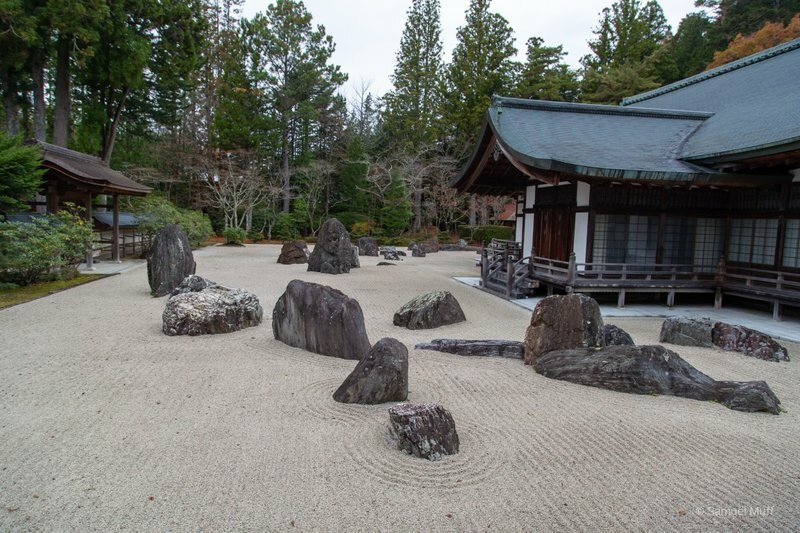 The best part of a temple stay in Koya-san though, happens very early in the morning. At 6am we were invited into Hondo, the main prayer hall, to join the monks in their morning prayer ceremony. As part of the ceremony we were asked to burn incenses and even chanted a prayer (Heart Sutra) with them. We left quiet Koya-san behind and set up our base for 6 nights in busy Kyoto. 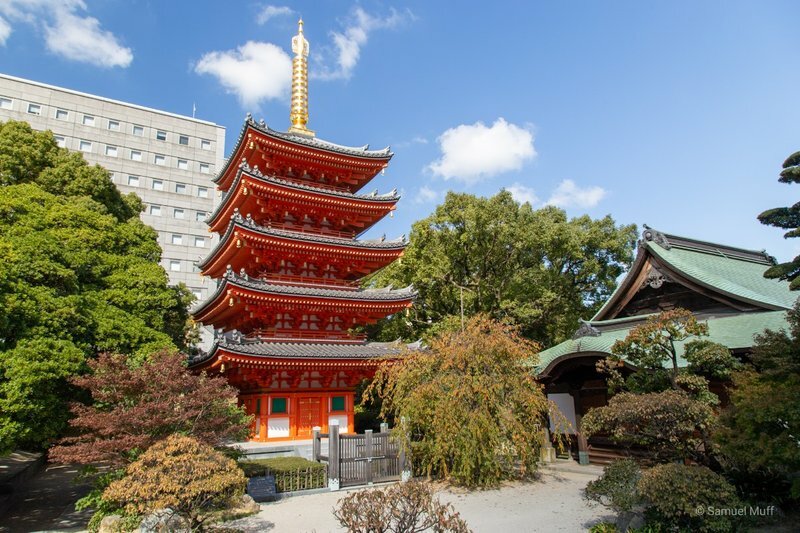 This city is not only packed with beautiful temples and gardens, it is also a great base to explore nearby cities like Nara, Osaka or Himeji. 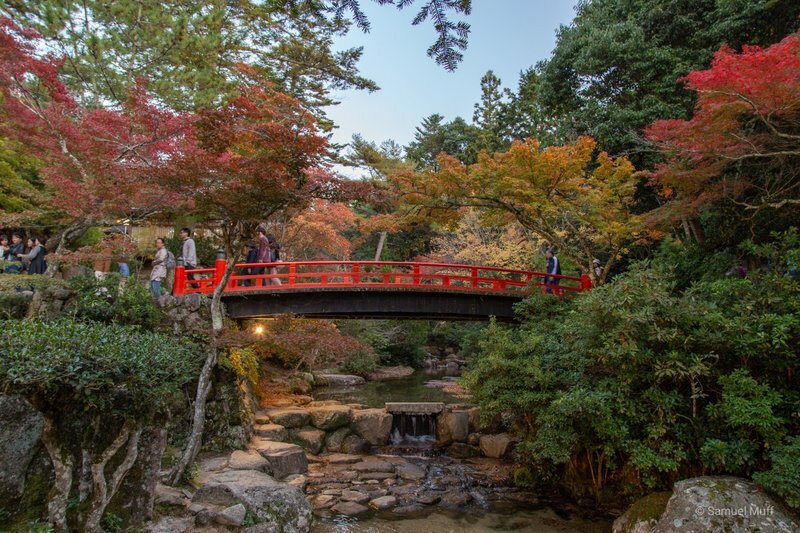 We had great difficulty finding accommodation here as mid-November is peak Momiji (autumn leaves) season. 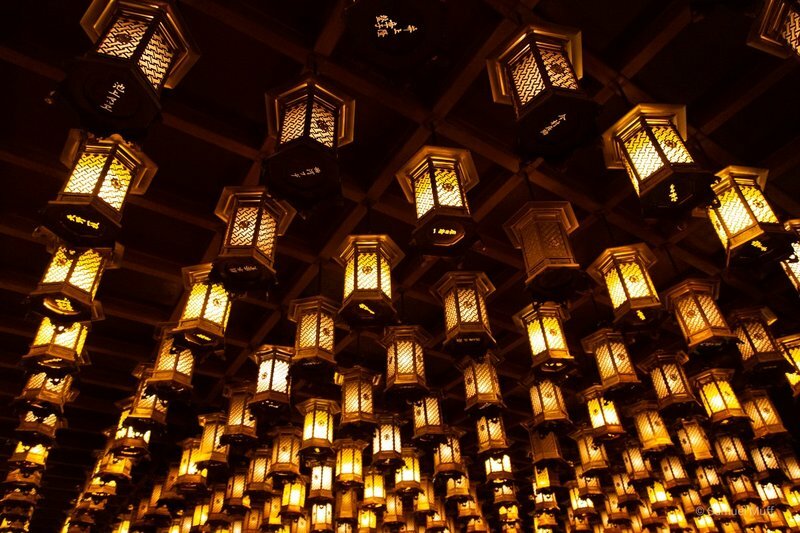 Together with Sakura (cherry blossom) season, this is the most popular time of the year. 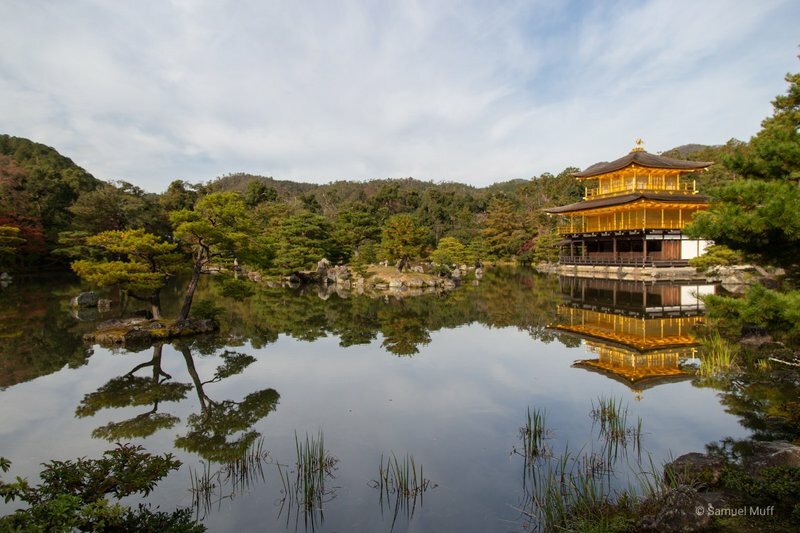 It was easy to see why Kyoto is so popular at this time. 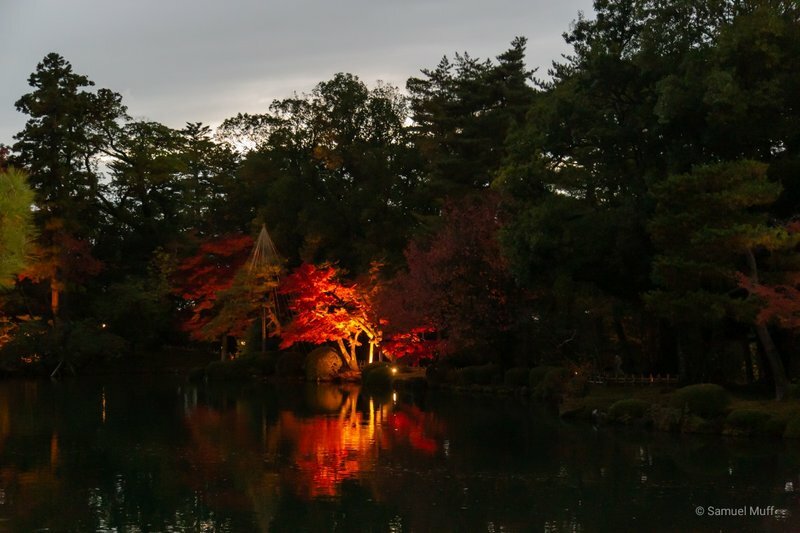 The different gardens and temples look almost unreal with the autumn leaves in deep shades of green, yellow, orange and red, all perfectly mirrored in calm waters of lakes and ponds. Due to the high season however, it was sometimes difficult to enjoy this beauty. The temples and gardens were all filled to the brim with people. 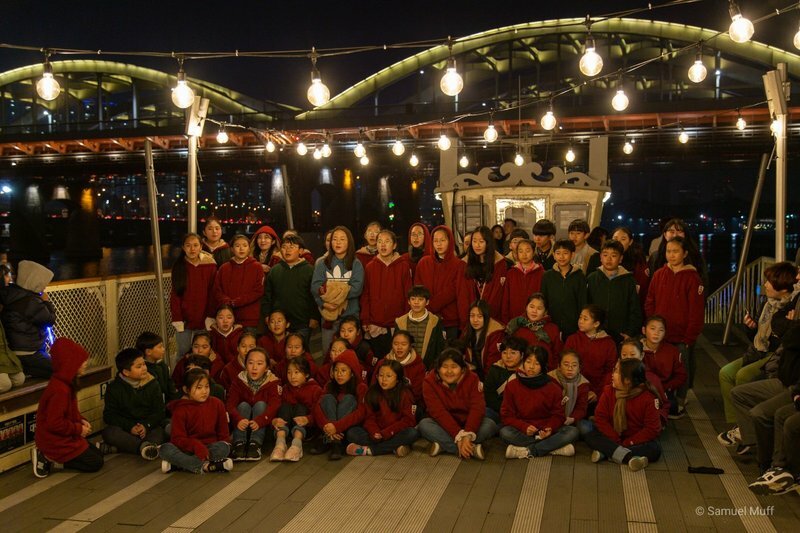 Going on a weekday or getting up early did nothing to help this, since countless groups of school children on excursions joined the tourists at those times. Entering these places sometimes felt like queueing up for the exit as the entire sightseeing route was spent in endless lines of people. 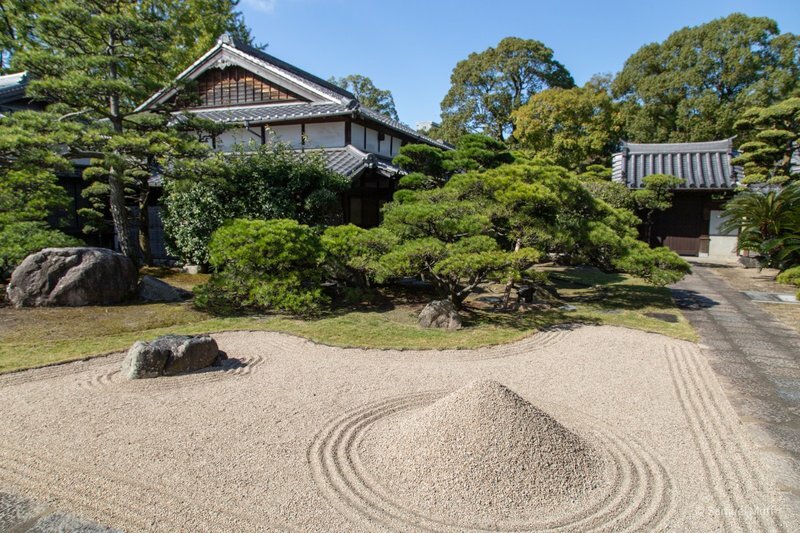 Kyoto was not a very Zen experience. 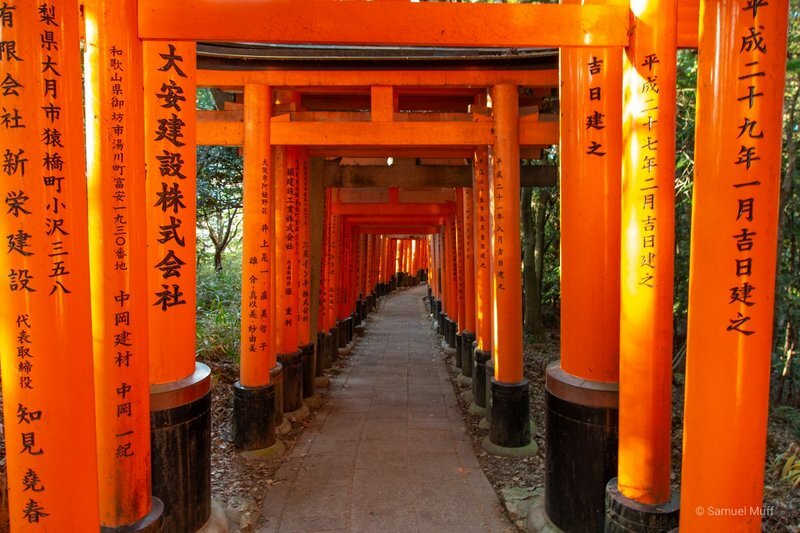 Our favorite among the places we visited was the Fushimi Inari-Taisha shrine. The famous walkways with the seemingly endless vermilion Torii gates were no less packed at the start. 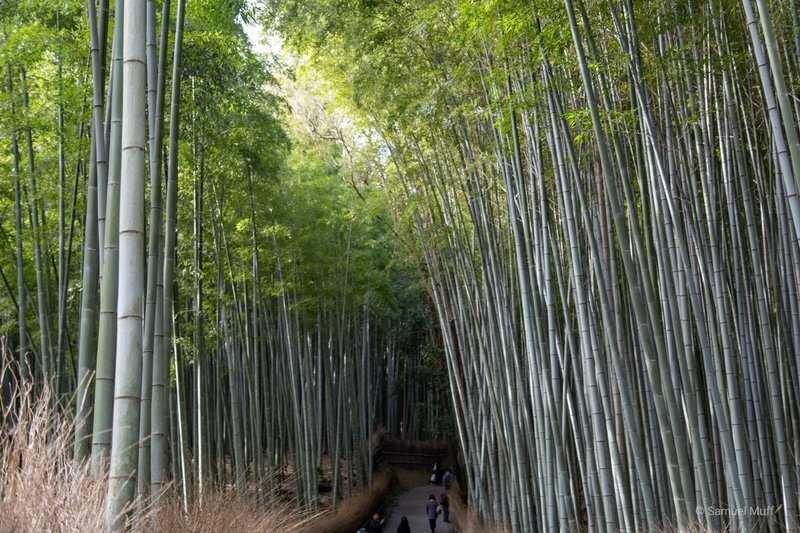 But when climbing higher up the hill on the nearly 5 kilometers long path, it got more empty and more enjoyable. 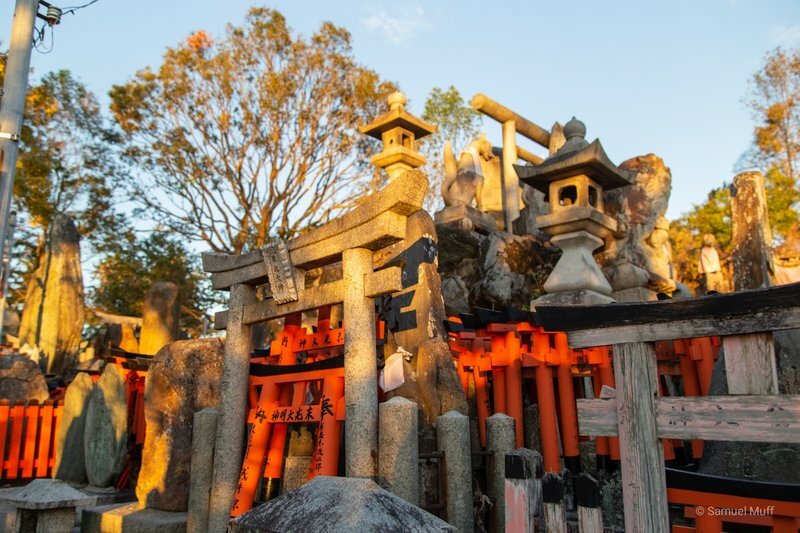 The path to the top is lined with many little shrines and graveyards, all with their own collection of miniature Torii gates. It was a truly magical place. 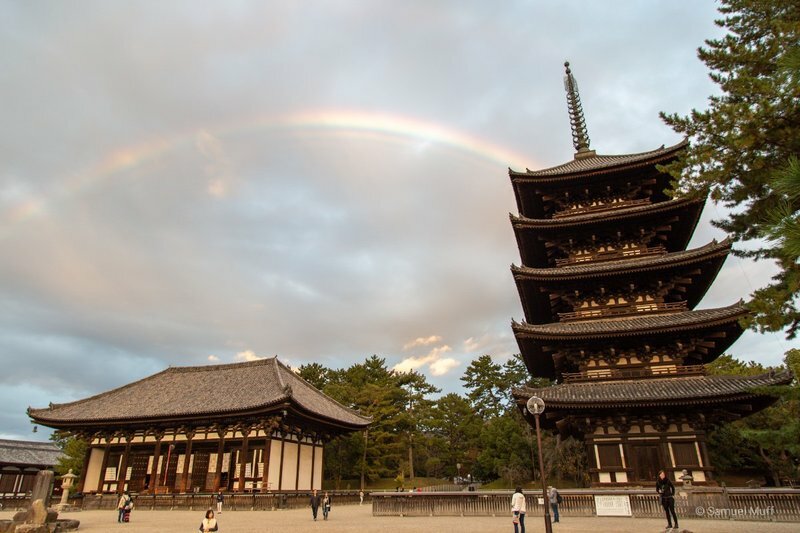 We visited Nara on a day-trip from Kyoto. 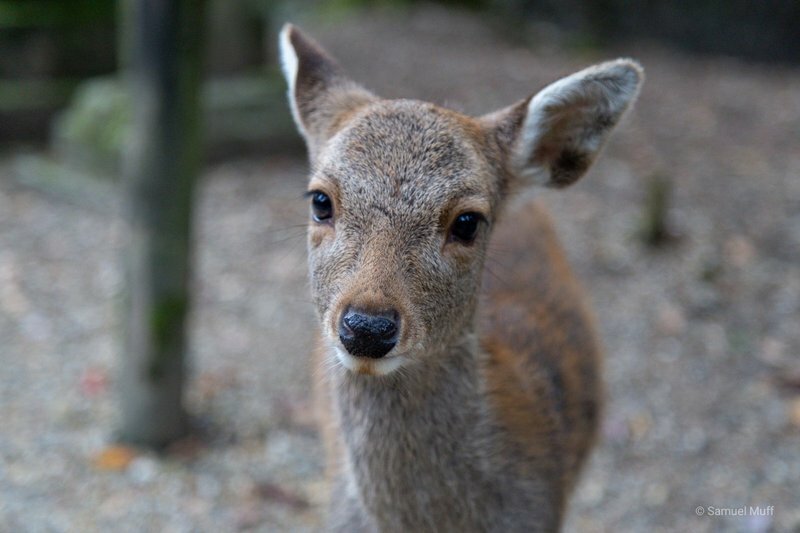 Japan’s 8th century capital is home to a huge park, filled with shrines, temples, gardens and hundreds of tame deer. 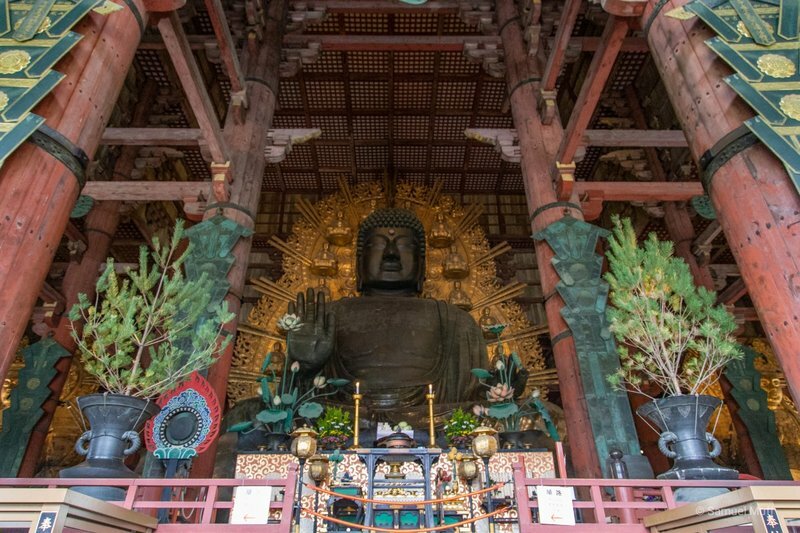 Nara is most famous for the 15 meter tall Daibutsu, Japan’s largest Buddha statue. We were strolling through the park, when a group of school kids approached us. 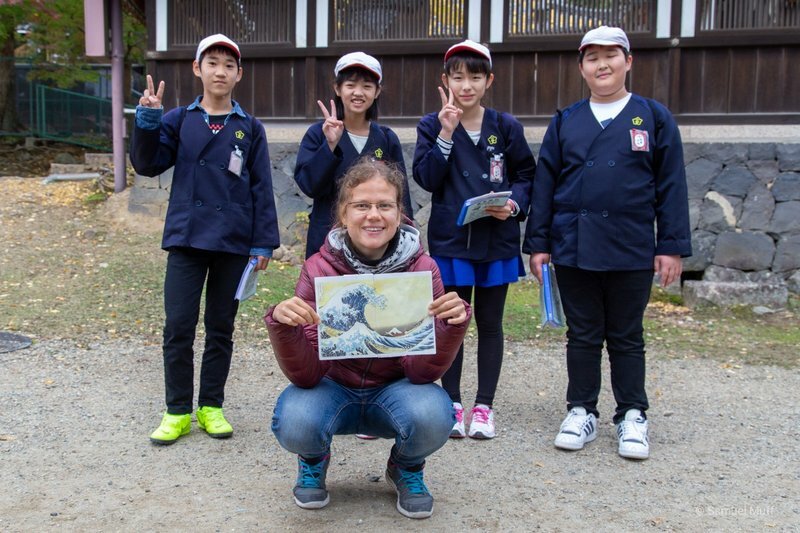 They were tasked to practice their English on tourists. After answering some simple questions, they awarded us for our cooperation with a nice painting. 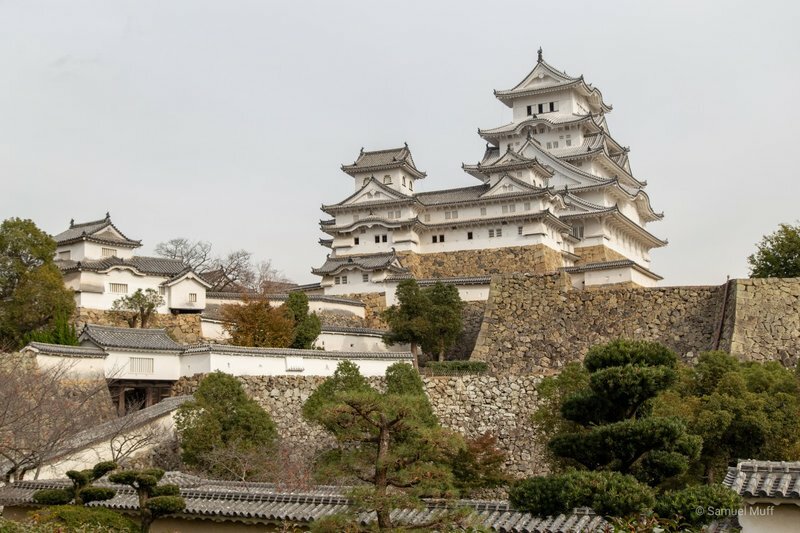 A short Shinkansen ride from Kyoto lies Himeji. 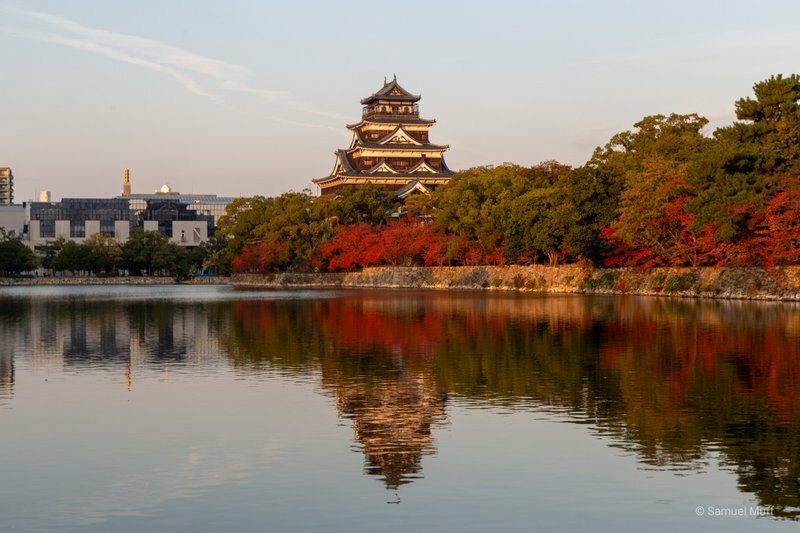 We came to the town to see the castle Himeji-jo, said to be the most beautiful in all of Japan. The castle did not disappoint. All in white, it thrones over the small city. We were surprised at how few people were visiting the castle that day. 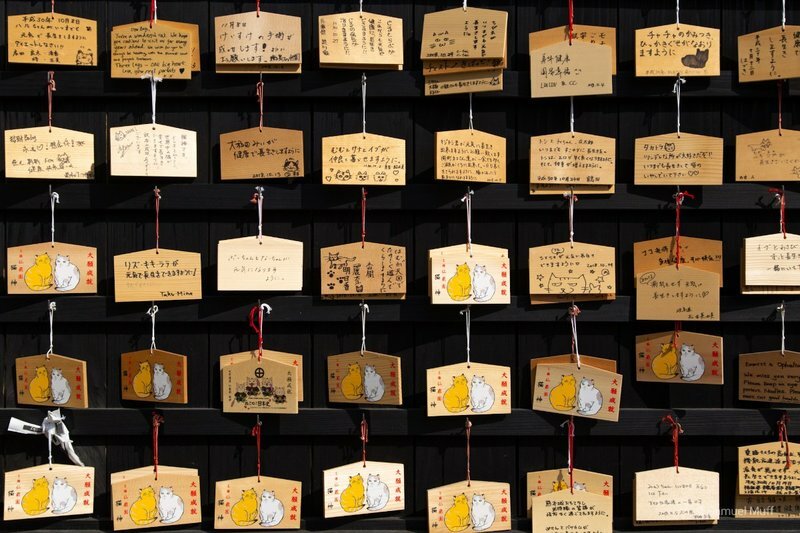 Probably everyone was in Kyoto. 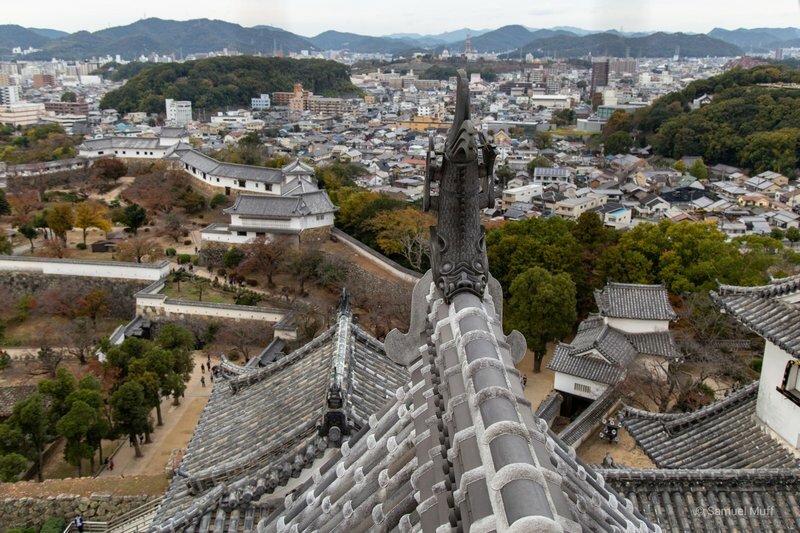 We could even go inside the completely wooden building and enjoy the view over Himeji from the top. Next to the castle there was also a very beautiful garden, Koko-en, which was very enjoyable given the few other people around. Our last side-trip from Kyoto brought us to Osaka. 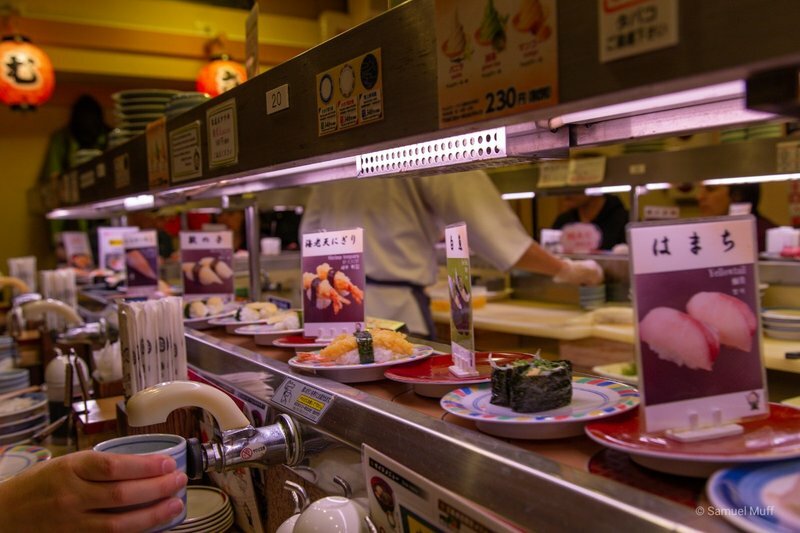 The city is the birth-place of conveyor-belt sushi, so of course we had to try it there. The park around the castle Osaka-jo made for an enjoyable afternoon stroll, but the best sight of Osaka comes to life only after sunset. 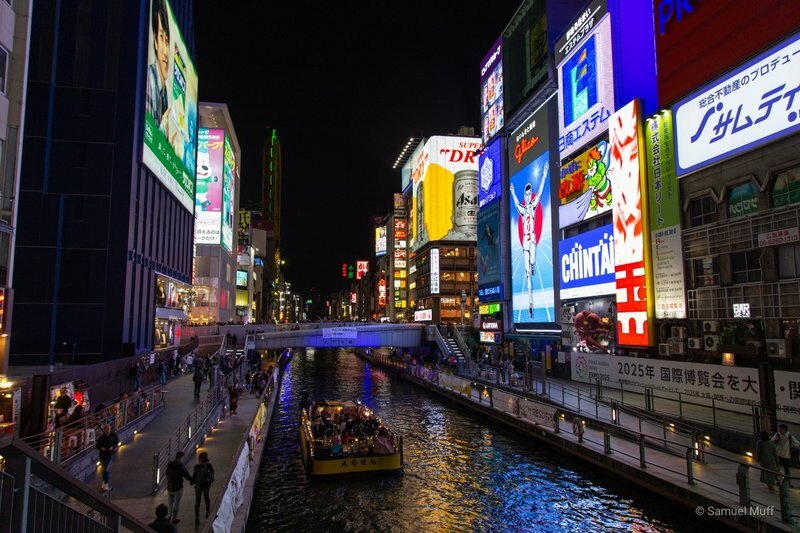 The entertainment district Dotonbori was a refreshingly different experience from the cultural sights of Kyoto. 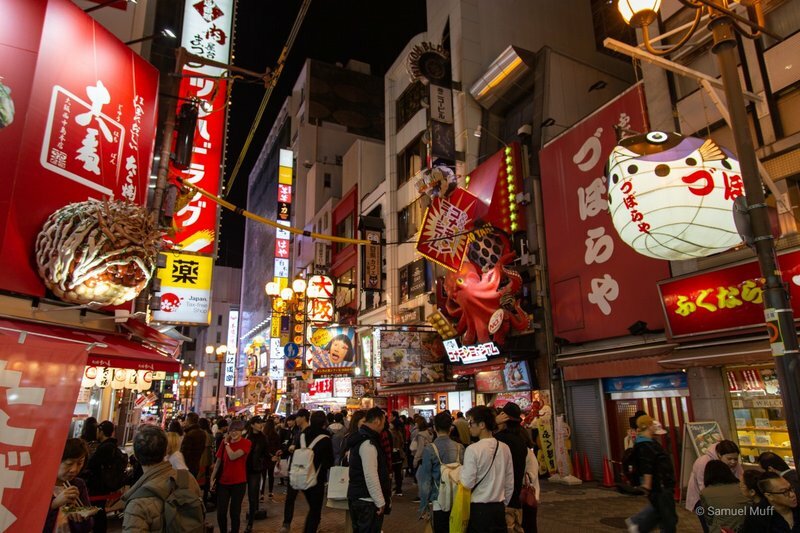 Blinking neon signs and crazy decorations scream for attention in this mad street. Our favorite was the giant, moving crab advertising a restaurant. 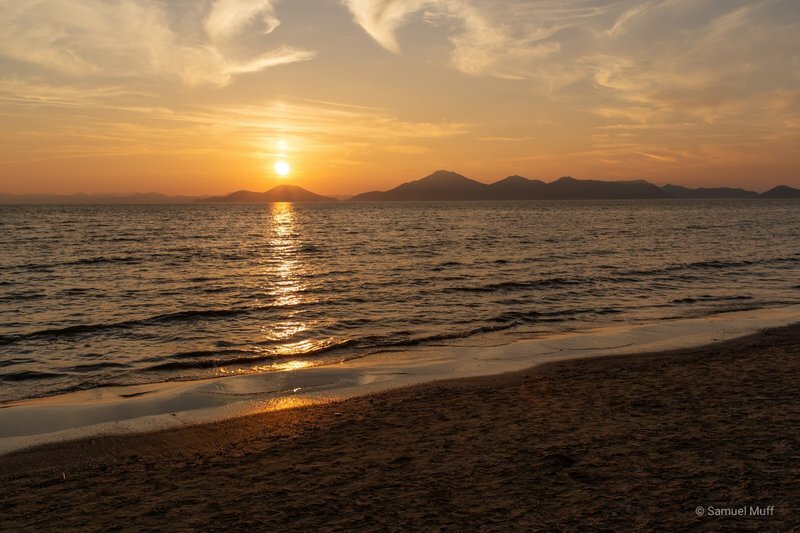 We spent our first four days in Japan in Kyushu, the smallest and most southern of the three major islands of the country. 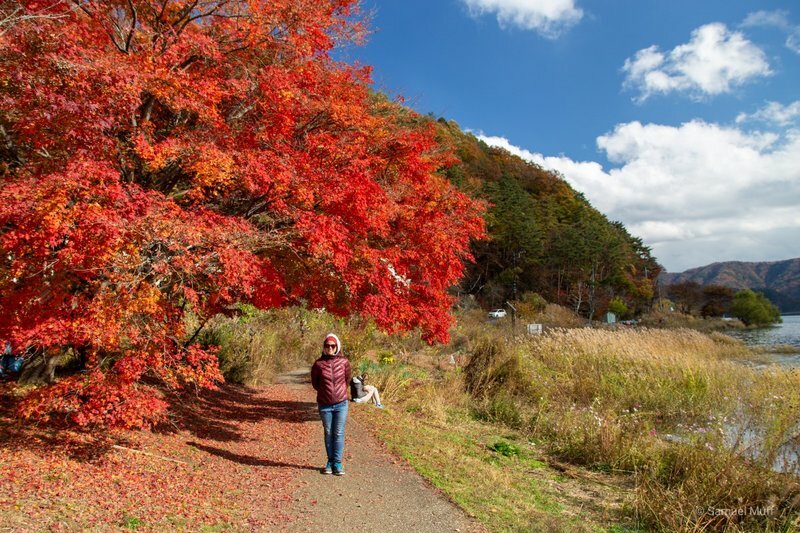 It is not on the main tourist route, as it is a bit far from Tokyo, and we only stayed there because it was the most convenient point of entry from South Korea. Having said that, Kyushu ended up exceeding our expectations and we wished we had stayed there longer. There are many beautiful places to explore and they are mostly quiet and serene. 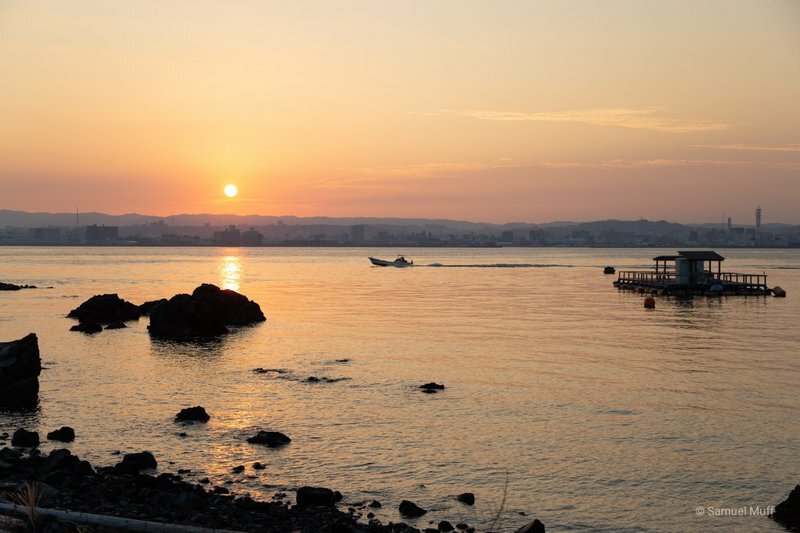 Our time in Kyushu started with the early morning arrival in Fukuoka, the island’s largest city. 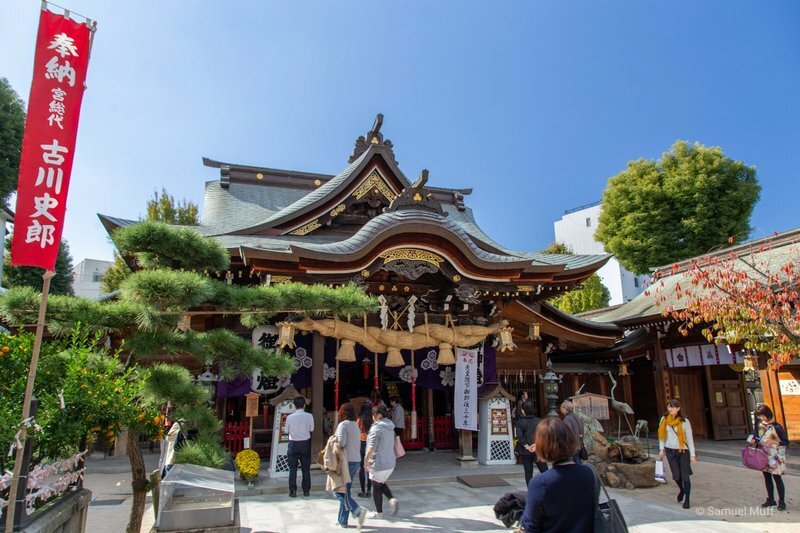 We spent one day in this town and were pleasantly surprised by the beautiful gardens, temples and Shinto shrines. All the sights were either empty or at most visited by a handful of locals, which made our day a very relaxing one. 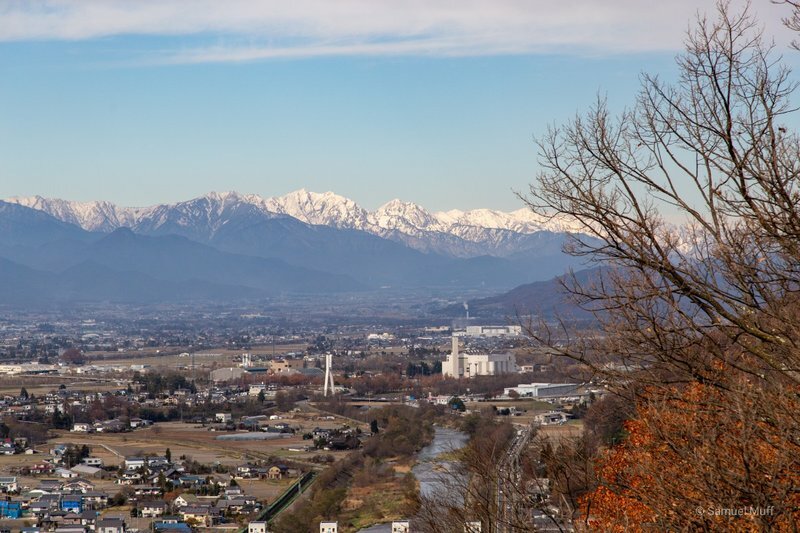 The next day we took the Shinkansen down to a very special city in the south of Kyushu. 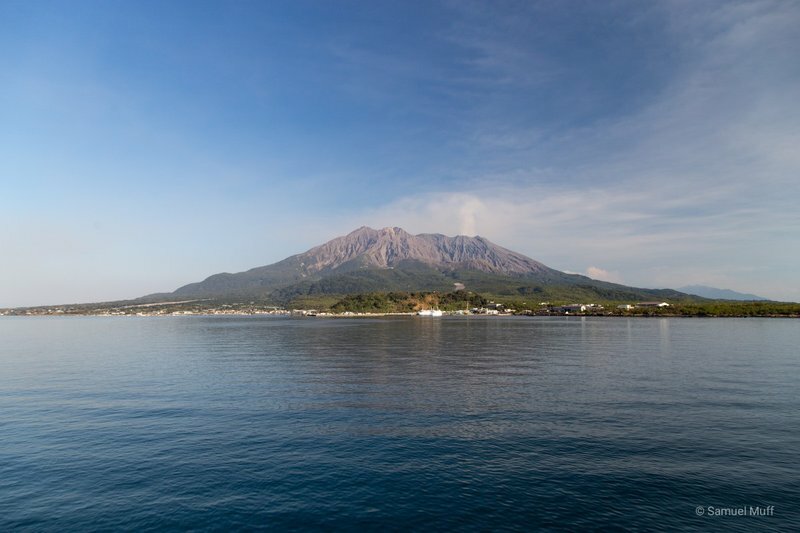 Kagoshima is located right next to a small island with a very active volcano, called Sakurajima. The volcano erupts on average once every 8 hours, but the small eruptions do not usually cause harm to the city. However, it is not uncommon for ash to fall over Kagoshima. While we were not fortunate enough to witness this, we did see smoke raising from the volcano during our entire stay. We took the ferry to the volcano in the afternoon and enjoyed a peaceful stroll along its shore. To end the day we had a relaxing foot bath, fueled by the heat of the volcano, in a park on this island. 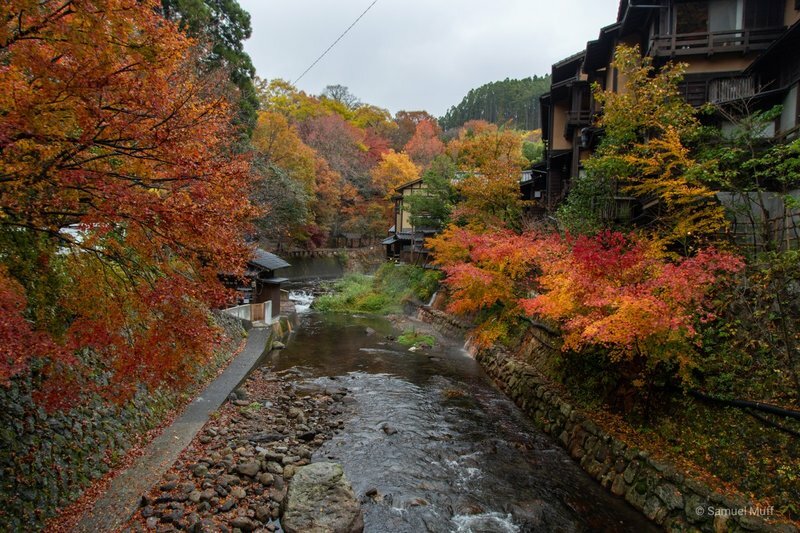 For a traditional Japanese experience, we headed to Kurokawa Onsen next. 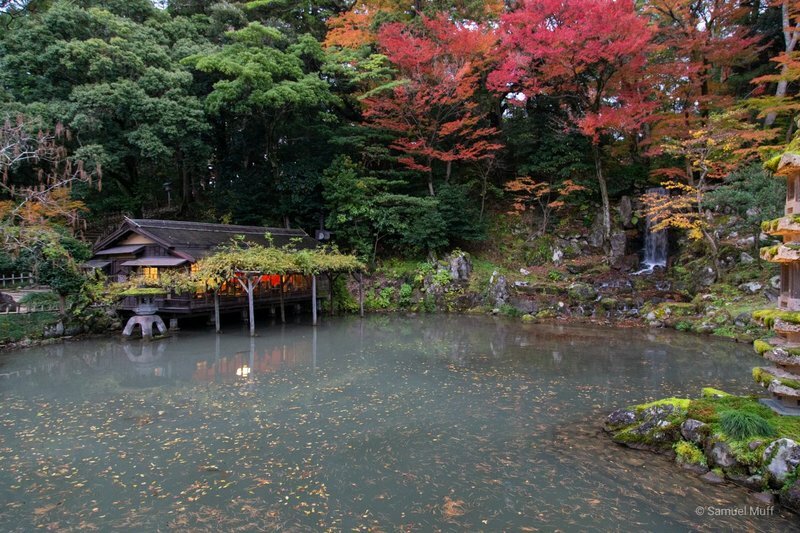 The secluded hot-spring village was the perfect spot to unwind and regain energy for our next adventures. We stayed in a ryokan, which is a traditional Japanese guesthouse where floors are covered with tatami mats and eating and sleeping is done on the ground. There, we were served an amazing kaiseki dinner to our room. 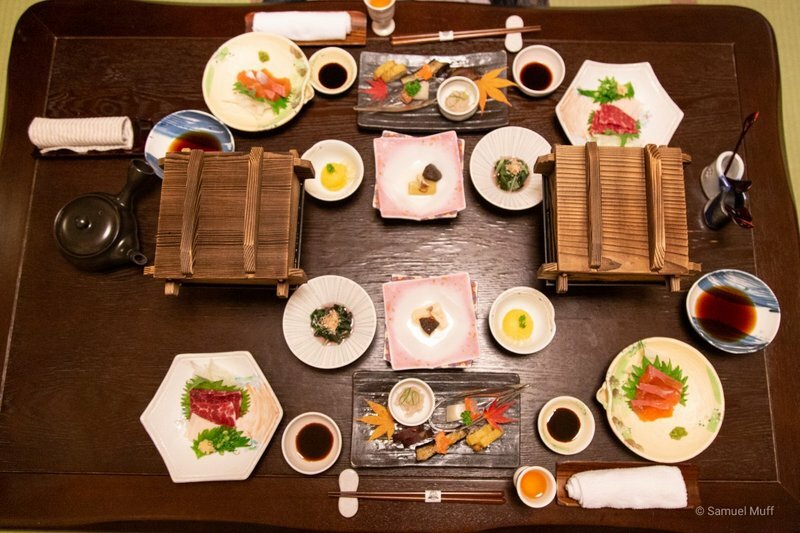 Kaiseki is the Japanese version of haute-cuisine, where you are served many tiny plates with different, artistically arranged dishes. If you thought this would not be filling, you would be wrong. Every 10 minutes or so, we were served another couple of plates, until we were grateful for the dessert which marked the end of the dinner. 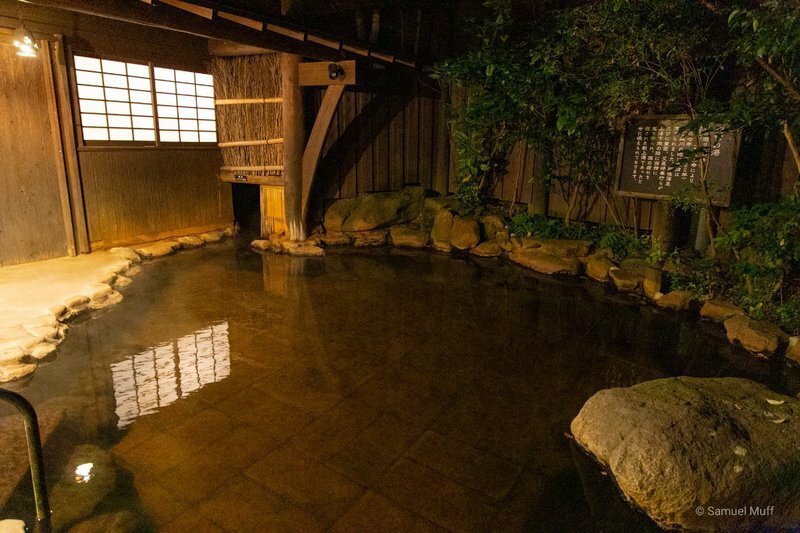 To make the evening even better, our ryokan also had it’s own onsens (hot spring pools). After some time in and out of the hot water, we went back to the room and slept like babies. 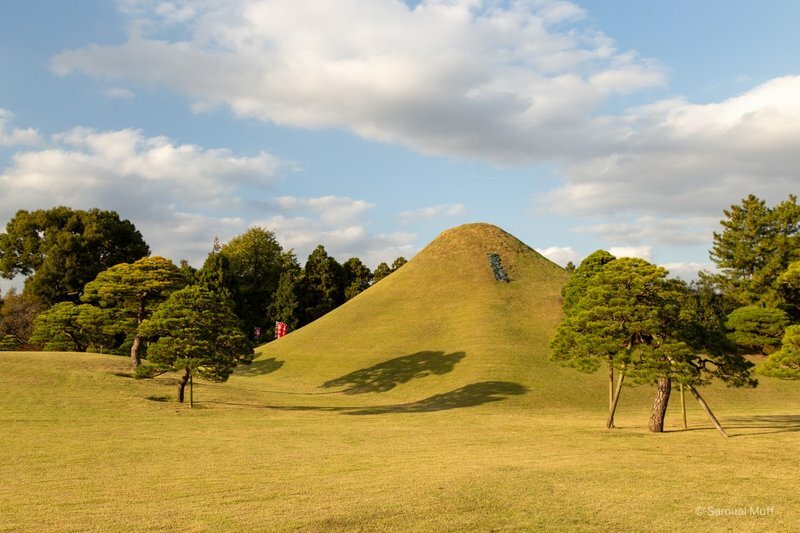 For our last day in Kyushu, we stayed in Kumamoto. 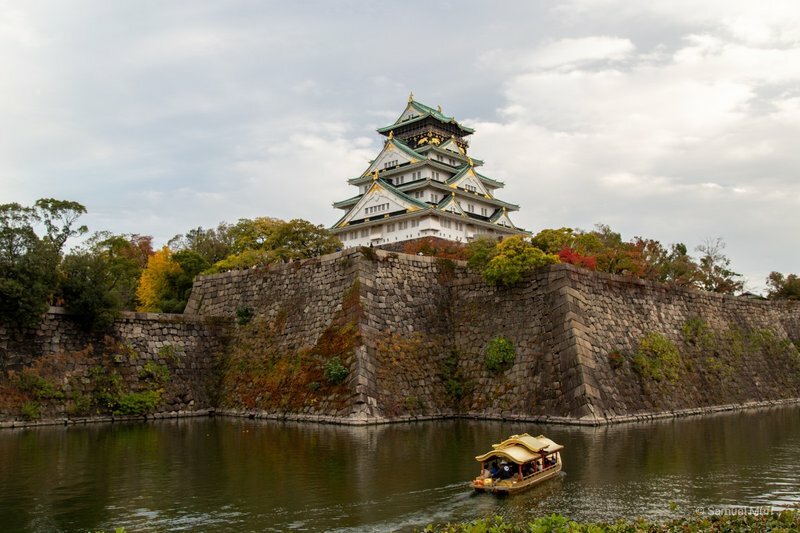 The city’s landmark, the castle Kumamoto-jo, was unfortunately still under reconstruction, after being damaged by an earthquake two years ago. 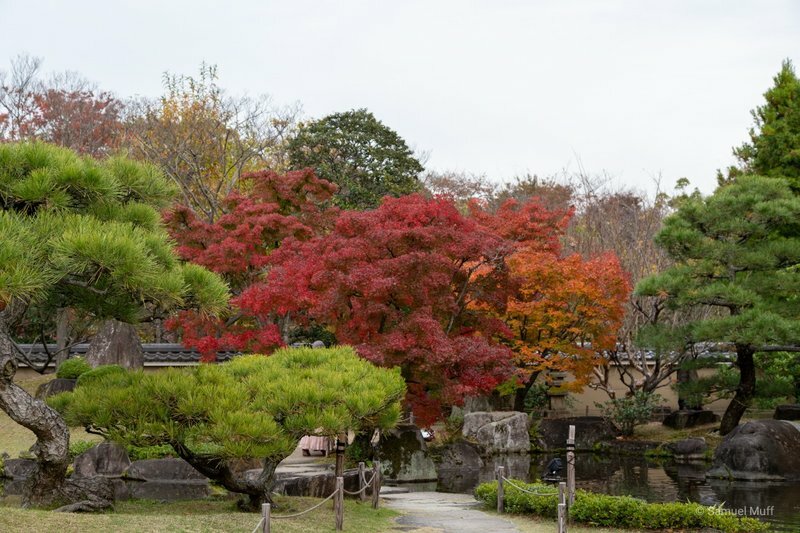 Instead, we visited the garden Suizenji-jojuen. 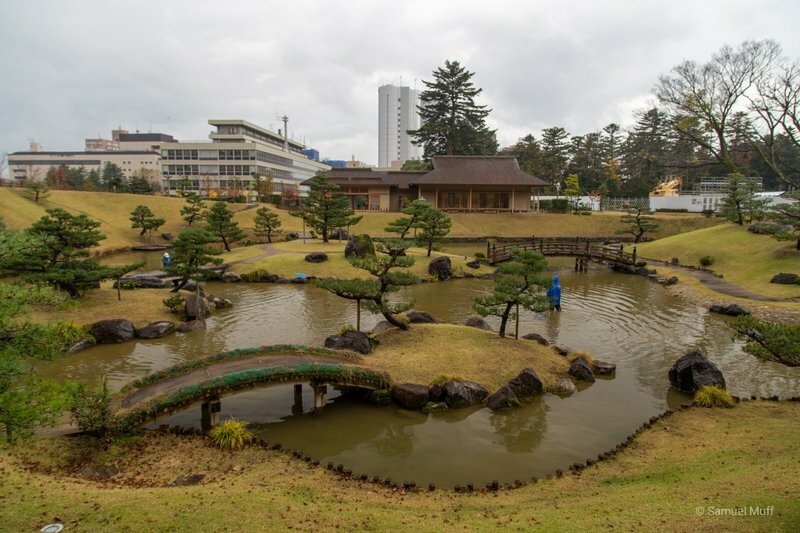 The garden featured an extremely photogenic pond and even had a miniature Mount Fuji. 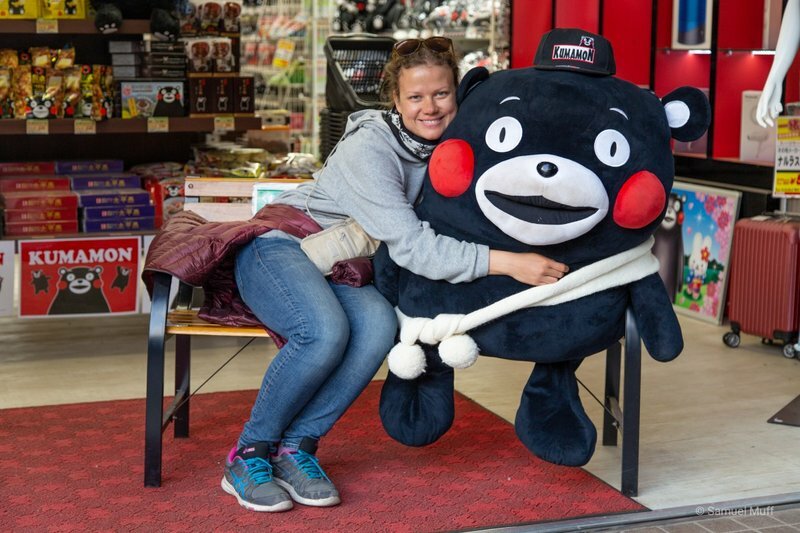 We also loved Kumamoto’s cuddly mascot Kumamon. It was difficult to find a spot in the town where you could not see its cute face smiling at you. 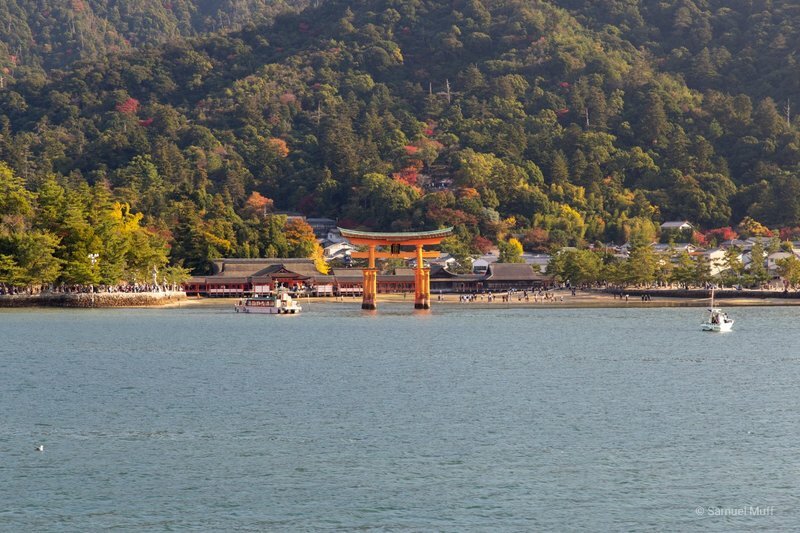 After we had left Kyushu, we spent an afternoon wandering around the island of Miyajima near Hiroshima. 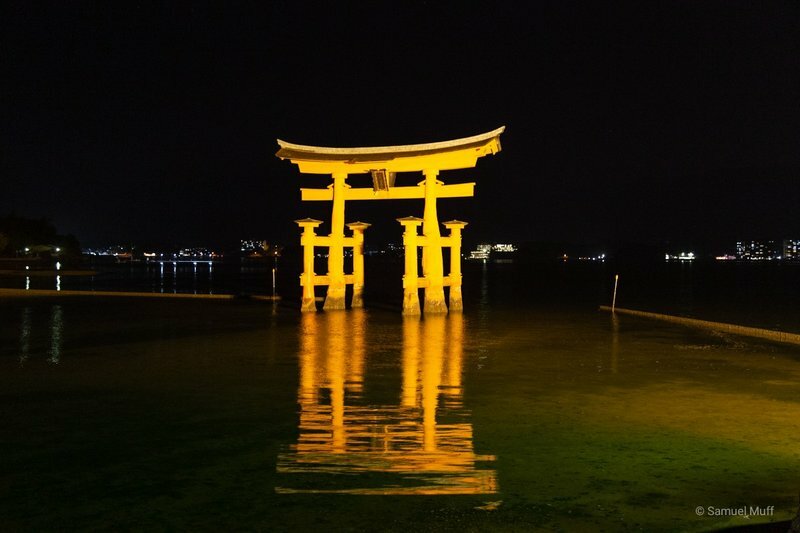 The island is mostly famous for its Floating Torii, a large Shinto gate built in the shallow water in front of a shrine. 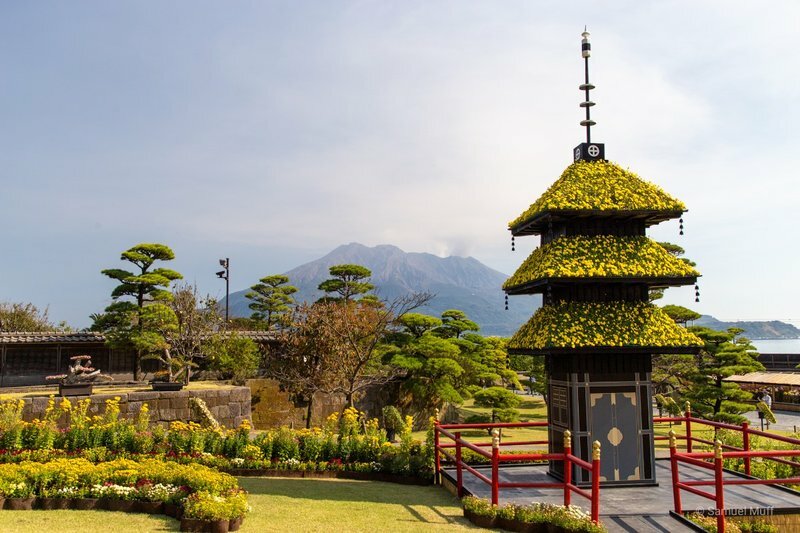 There were, however, also many nice gardens and temples on this island to discover. For the first time in Japan, we had to deal with the big crowds that the major attractions draw, especially since it was a Saturday. Sunday we spent in Hiroshima, where the main “attraction” is the city’s tragic history as the world’s first target of an atomic bomb attack. 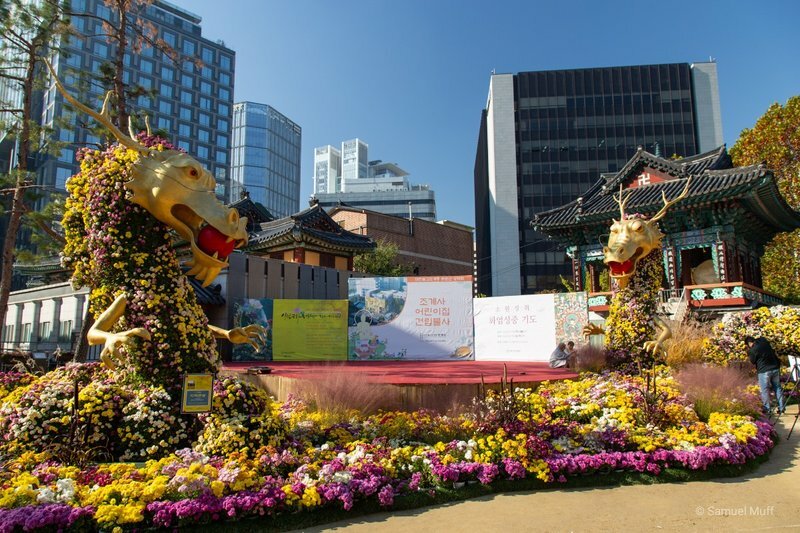 A beautiful park in the center of the city is dedicated to the victims of this event. 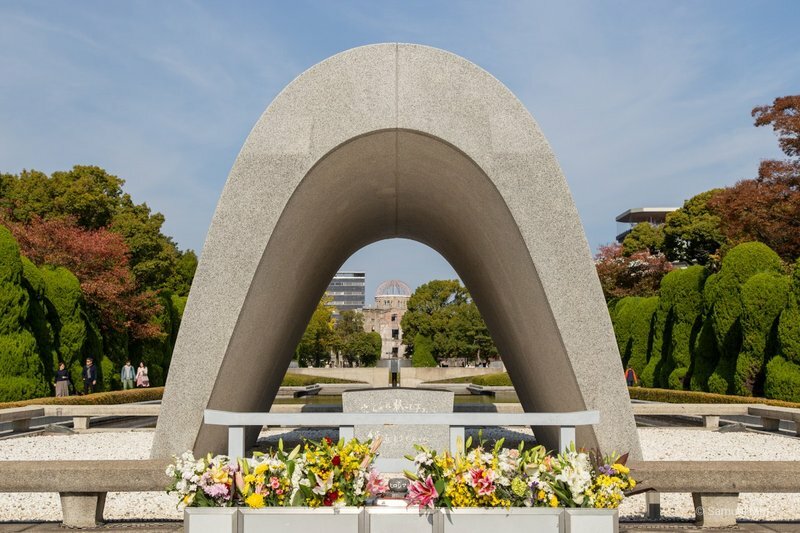 Many monuments are scattered throughout the park, for the memory of the deceased and for a future world without nuclear weapons. 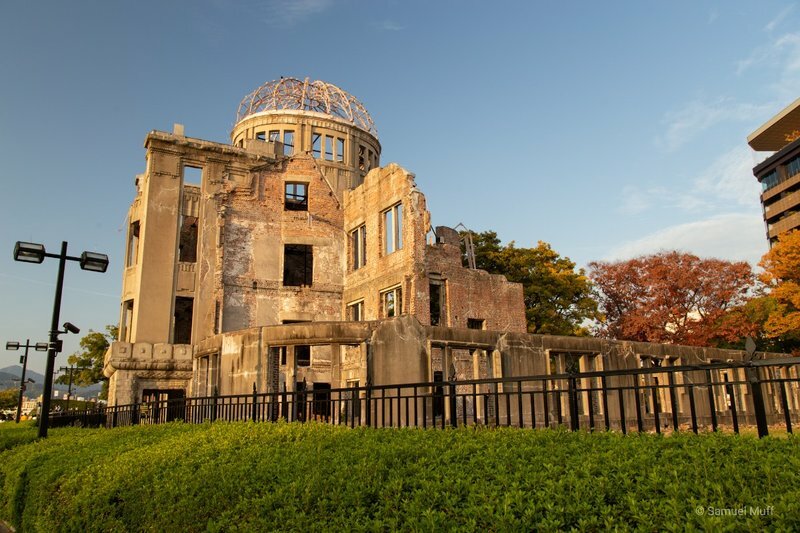 The most impressive sight in the park is the Atomic Bomb Dome, a building that was almost in the epicenter of the explosion and one of very few that was not completely destroyed by it. The building was left unchanged since then, neither demolished nor reconstructed, as a memorial to the tragic event. 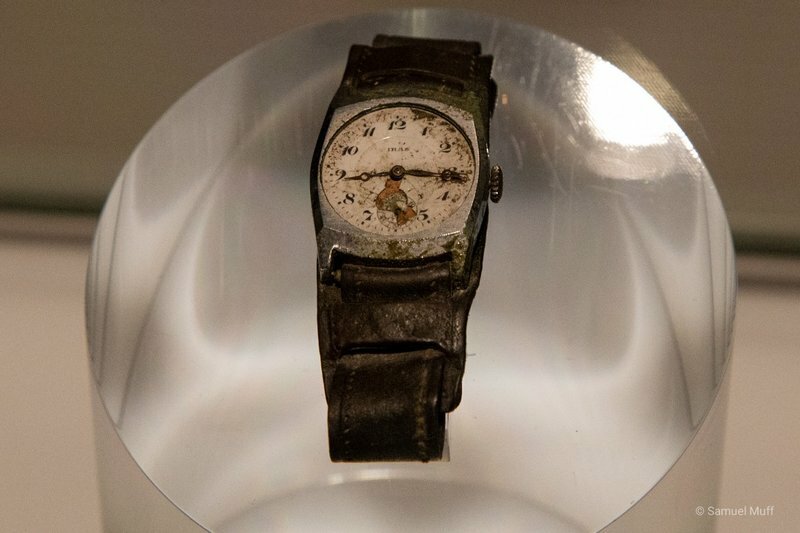 We also visited the Hiroshima Peace Memorial Museum, where the gripping tale of the first atomic bomb attack is told. From the early development of nuclear weapons to the horrifying effect the bomb had on the civilians affected by it. We ended the day on a lighter note with a visit to the city’s castle, Hiroshima-jo. 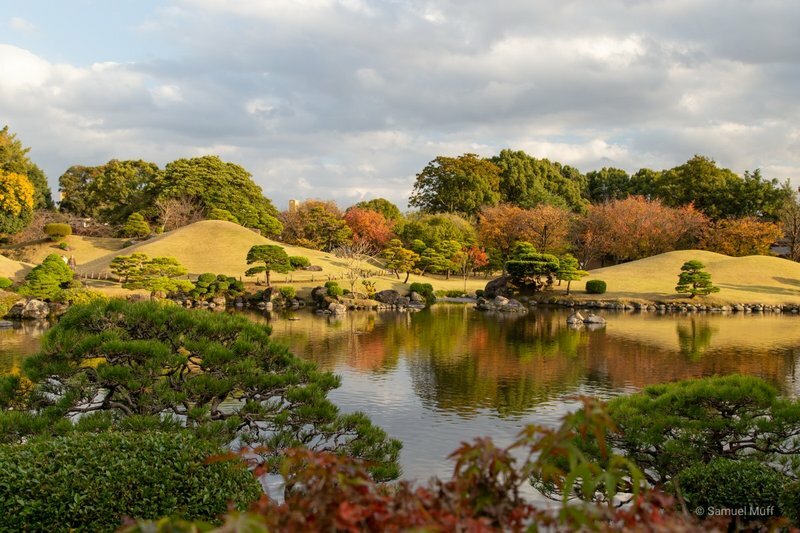 Besides the many interesting sights and the beautiful weather, we were also spoilt by the amazing food during our first six days in Japan. Of course we had some great sushi, but we also enjoyed the many local specialties that can be found in every city. Fukuoka is the birthplace of ramen noodles and their tonkotsu ramen, with a broth made from pork bones, is incredibly flavorful. In Hiroshima, we had okonomiyaki prepared in front of us on a steel plate. These pancakes are filled with cabbage and bacon and topped with noodles and a savory sauce. Last but not least, we loved the dozens of little dessert shops at the Kumamoto train station. Based on things like bean paste, sweet potato or macha tea, these desserts were not as sweet as candy, but just as addictive. We apologize if this paragraph made you hungry. 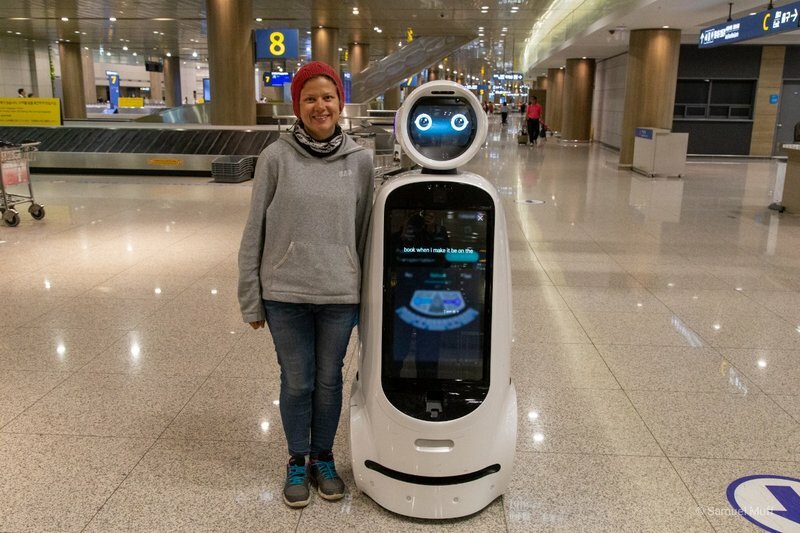 It was apparent that we got back into the first world, when a friendly robot greeted us at Incheon airport. Our night on the plane from Bangkok has been short and so we retreated to our hotel to rest and make some plans for the next weeks of travel. In the evening, we met Sang Hyeon, Marta’s friend from her PhD studies, for dinner. We got a great first taste of the Korean cuisine as he invited us to a fantastic restaurant where we were able to taste about a dozen different dishes. 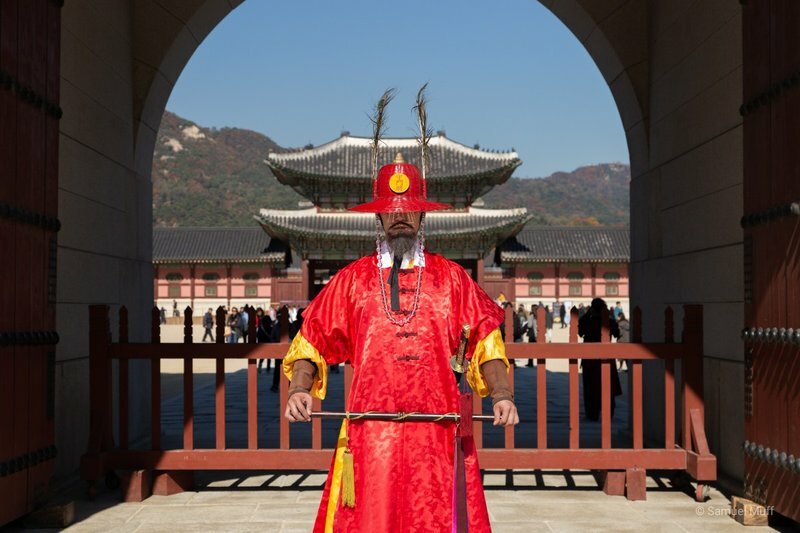 The next day we visited Gyeongbok palace, the residence of Korean emperors for many centuries. It was amusing to watch the change of the guards in front of the gate, despite the fact it is just an act for tourists nowadays. The palace was like a smaller but more pretty version of the Forbidden City in Beijing. 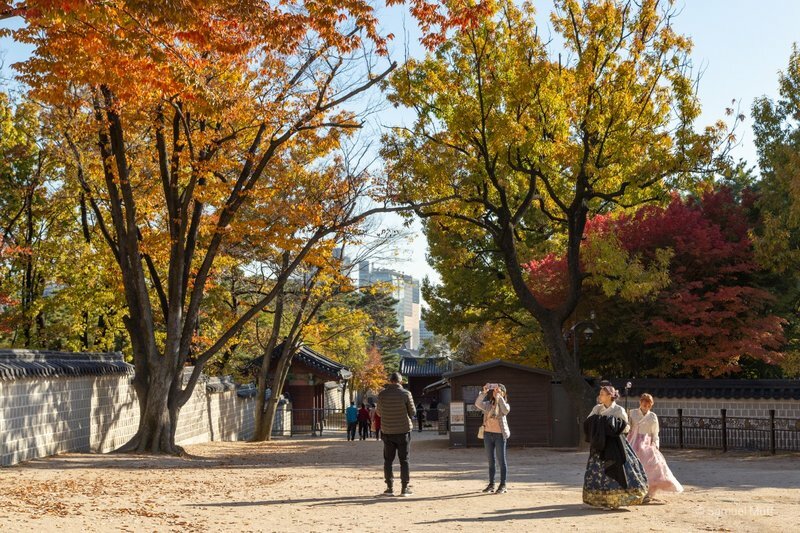 It offered not only beautiful buildings, but also lots of trees in bright autumn colors. 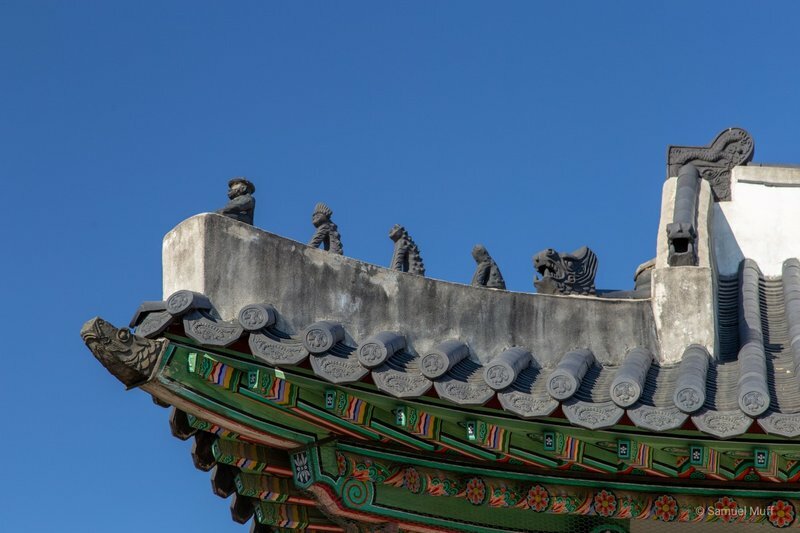 The traditional Korean houses differ from their Chinese counterparts most notably in the shape of their roofs, which curve up towards the edges. 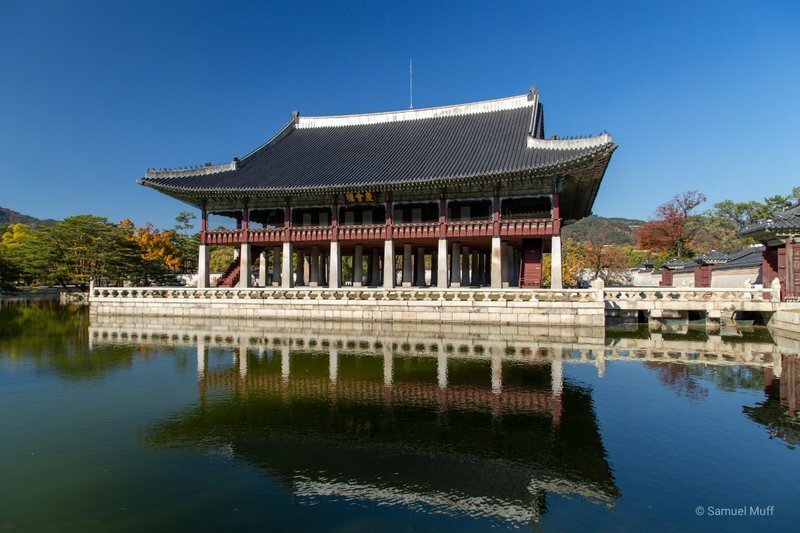 This palace is also the place where the Korean script was invented. 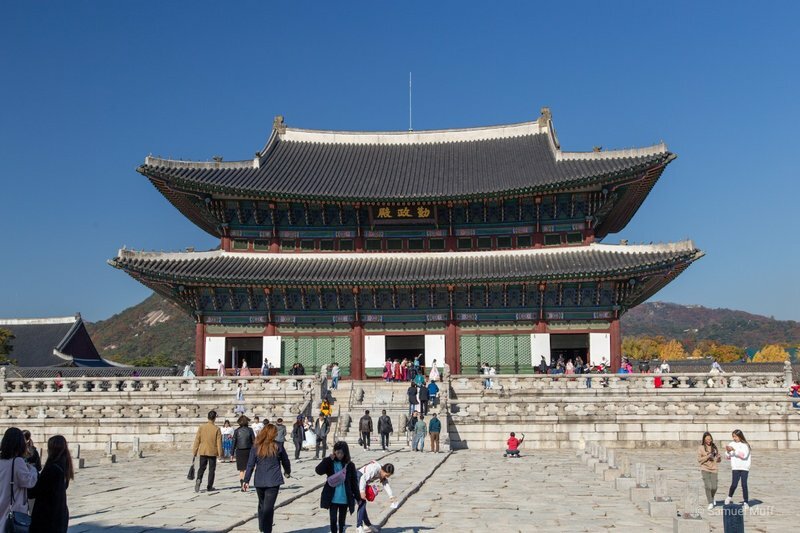 Unlike the roofs of the buildings, the Korean characters are very geometrical, consisting mostly of straight lines, right angles and circles. 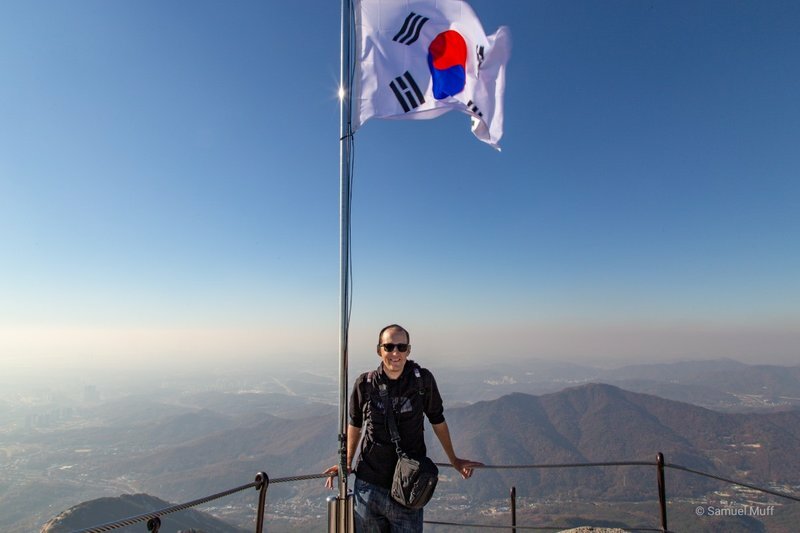 Our tour guide explained, that a smart person can learn to pronounce every Korean character in a day, since the shape of a character is directly related to its pronunciation. 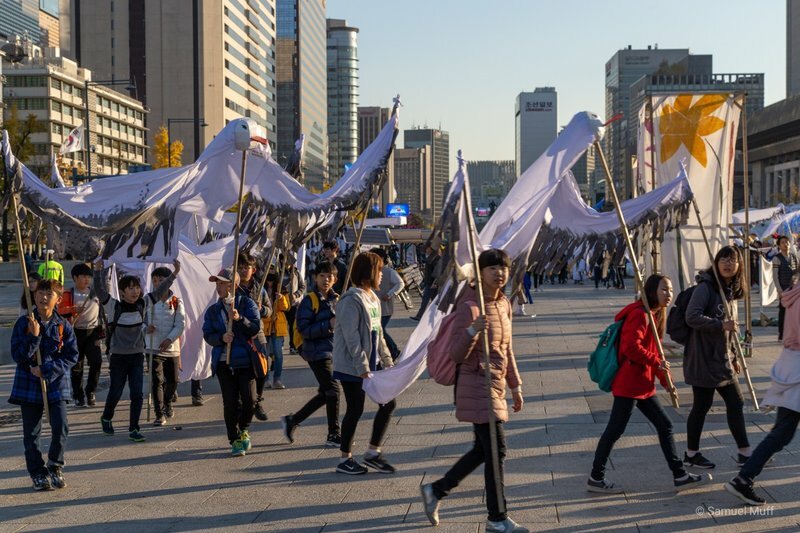 Upon leaving the palace, we witnessed a demonstration for peace on the Korean peninsula. 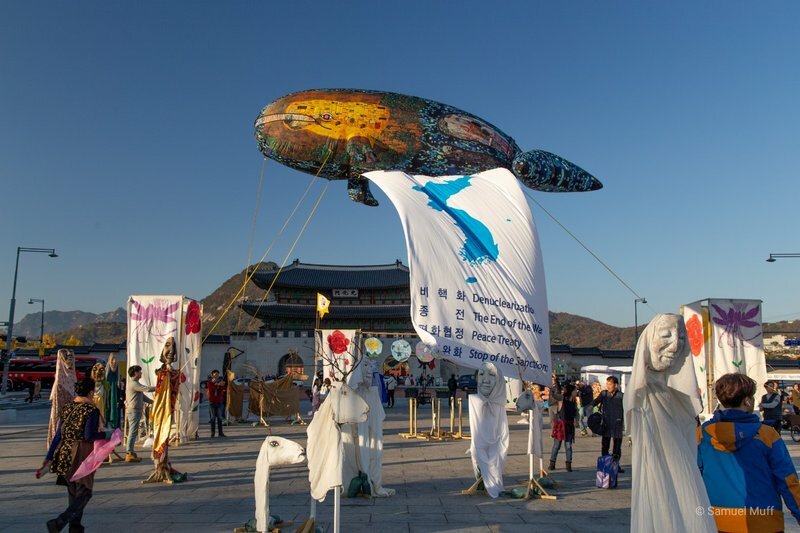 Surprisingly, the event had similarities to a carnival, as many demonstrators wore costumes, danced and played instruments. 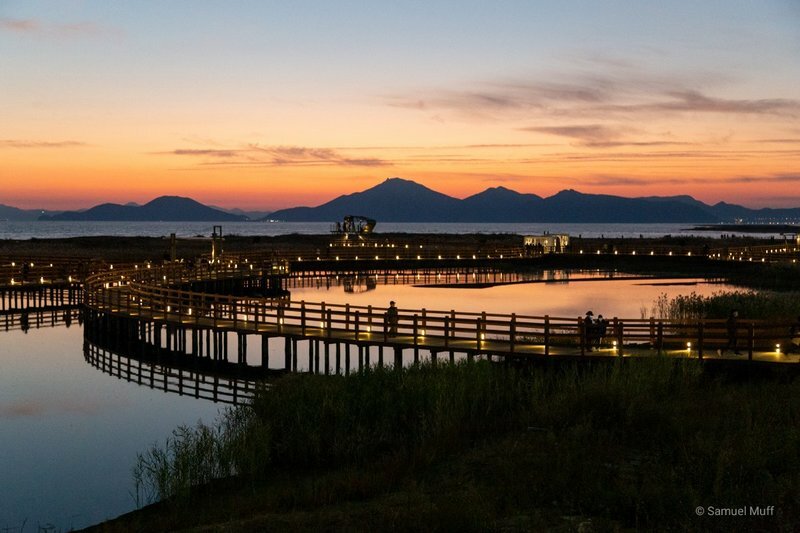 Just north of the city and easily accessible by public transport, Bukhansan National Park is the most popular getaway for Seoul’s nature-loving residents. 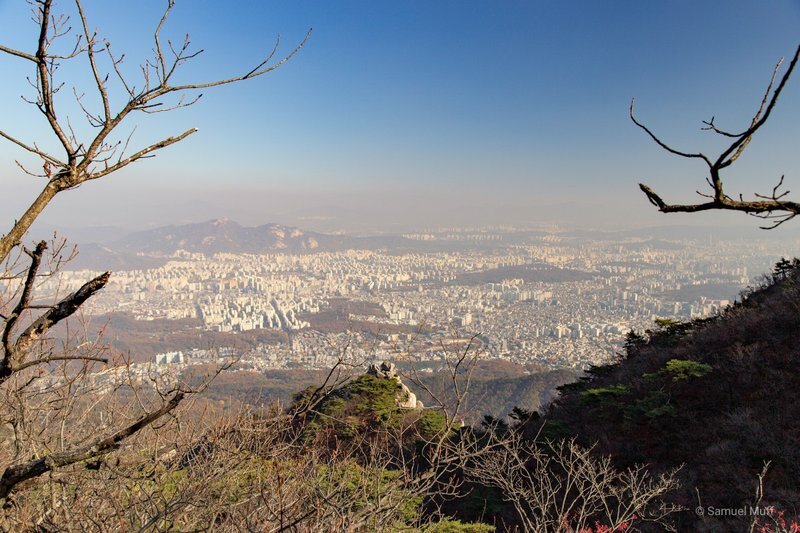 We decided to hike to the park’s highest peak, Baegundae, to get the best city views. 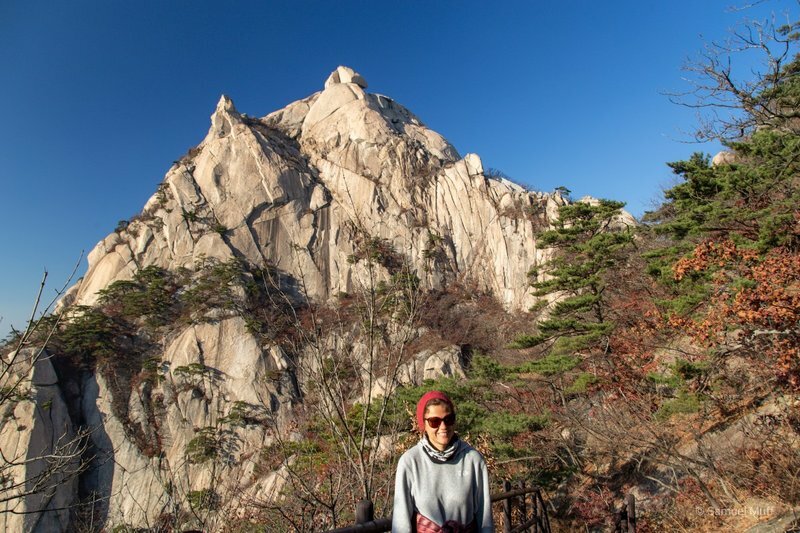 Hiking is very popular in South Korea, so despite the fact that it was a weekday, the park was full of fit Koreans of all ages. The well-marked path led us along rivers and through the forest in its most photogenic colors. For the last 15 minutes, the path became quite difficult. 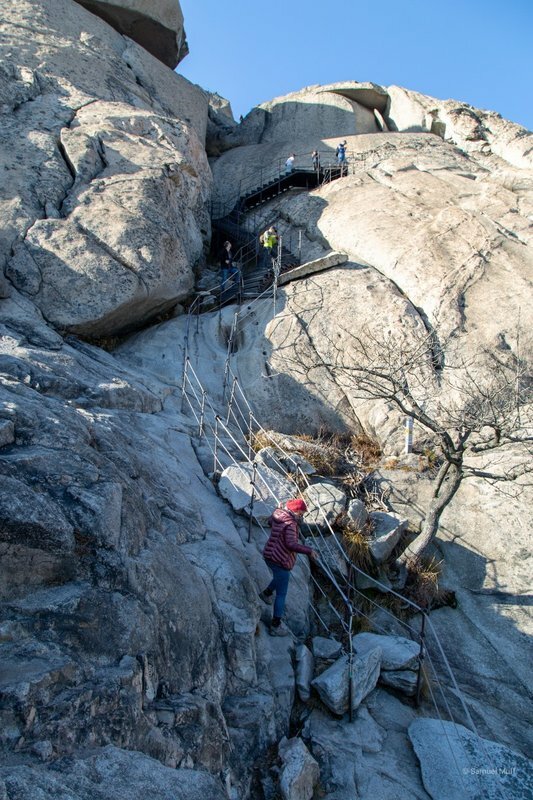 We had to use ropes to climb up the steep rock face to the top. 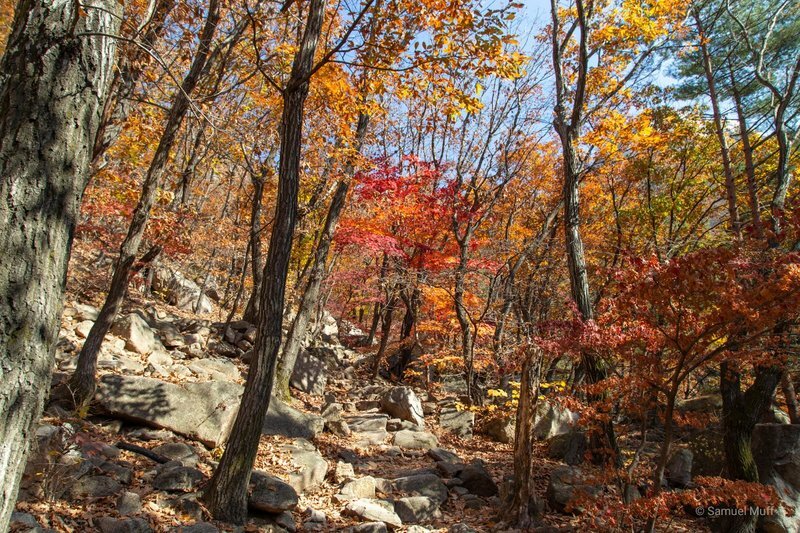 The main part of the city was hardly visible unfortunately, but the hike was still worthwhile due to the beautiful colors of the forest. In the evening, we went to see a “Nanta” show. The popular Korean production is probably best described as Blue Men Group in the kitchen. The actors use food and kitchen utensils to make music and do acrobatic stunts. However, the slapstick humor was a bit lost on us. 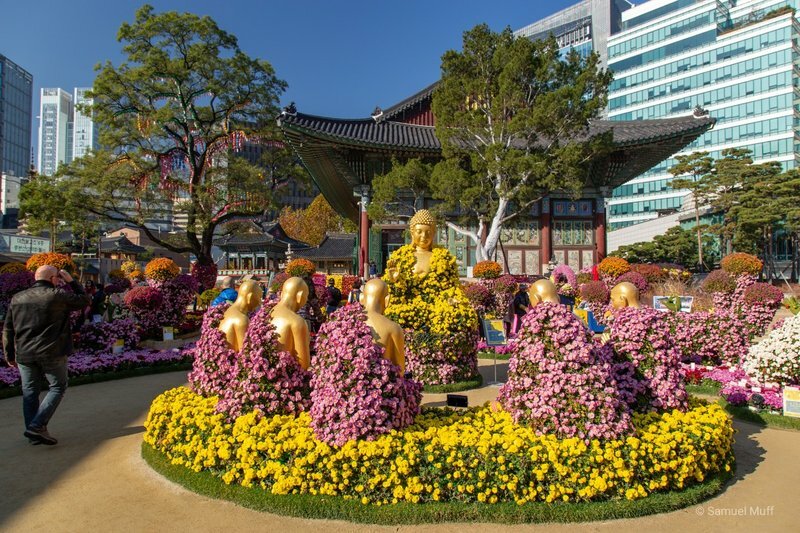 On our fourth and last day in Seoul, we visited Jogyesa Temple. 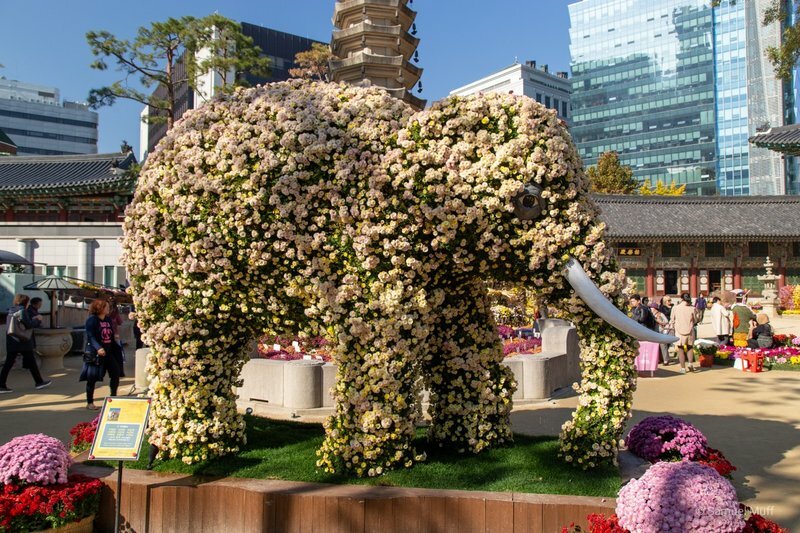 There was a special festival happening and the area around the temple was filled with stunning flower displays in the shape of various animals and religious figures. 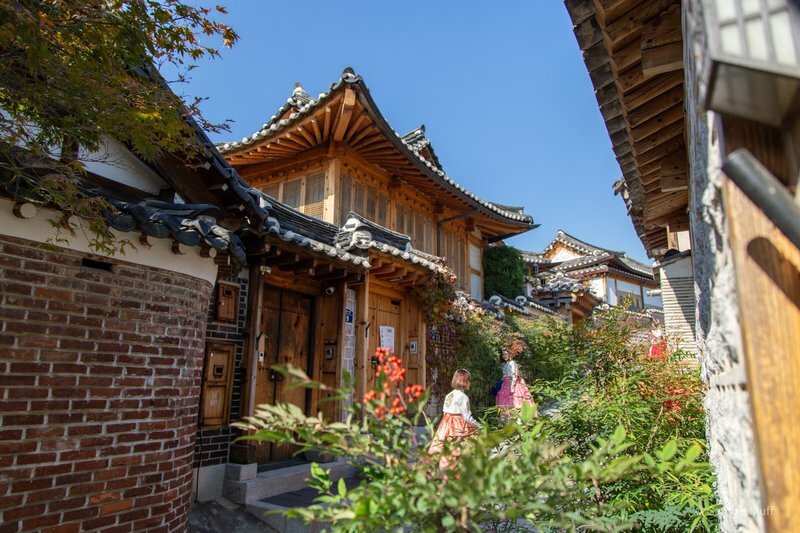 Later, we visited a street with traditional Korean houses (Hanok Village) and the War Memorial of Korea. The latter is one of the best museums we have ever seen. 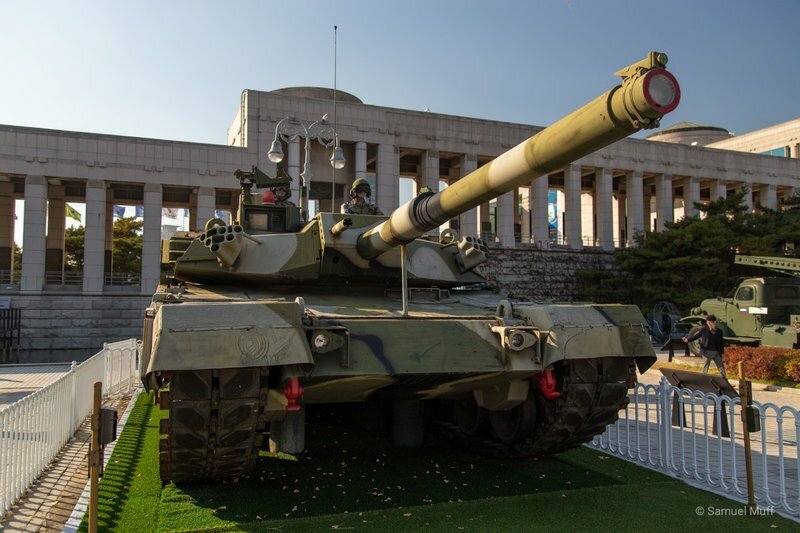 Outdoors, it exhibits hundreds of real vehicles and devices used in the Korean wars, like airplanes, tanks, destroyers, missile launch systems and much more. 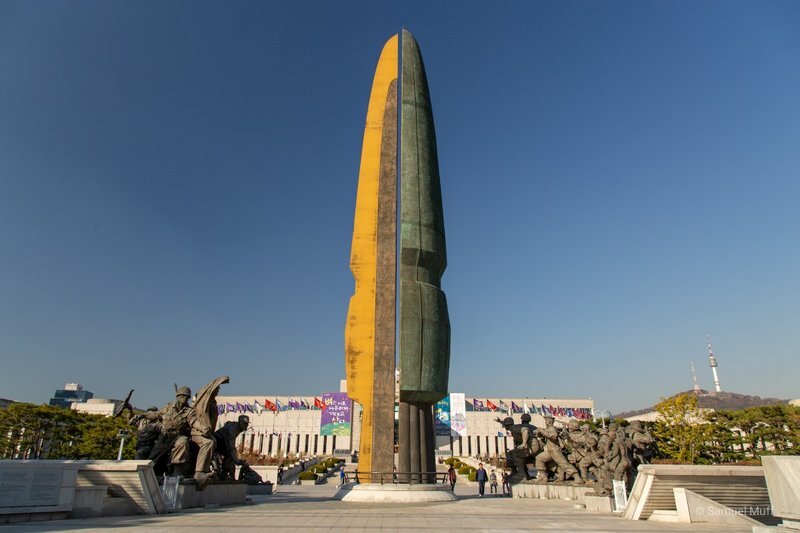 Inside, there are many impressive video installations that show the difficult history of Korea in a very approachable way. 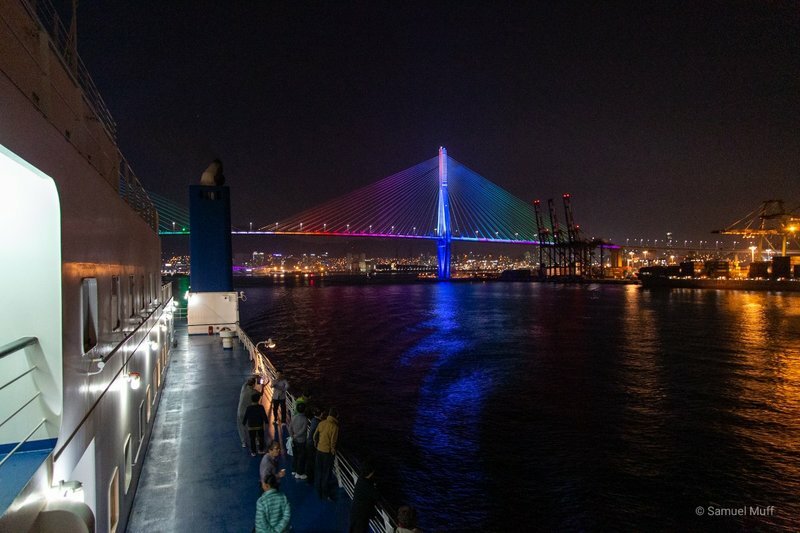 The Han river cruise we attended in the evening was a bit disappointing. 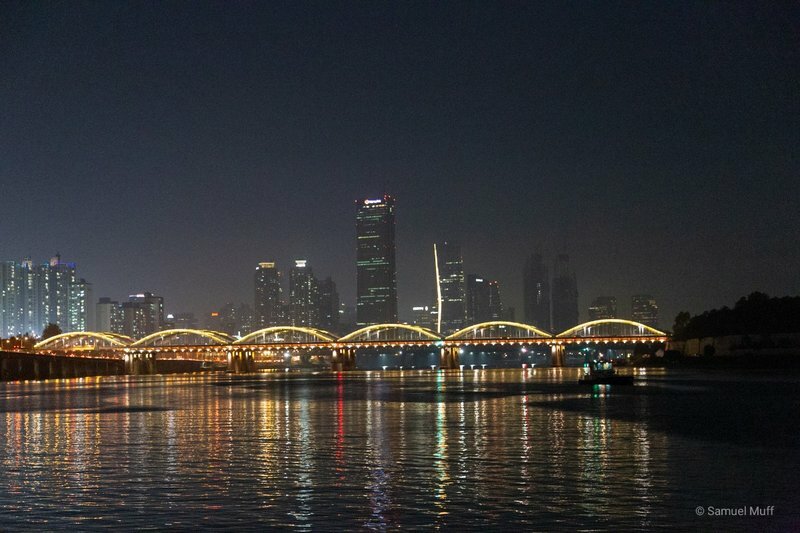 Seoul is a huge city with no clear center so its skyline is not as impressive as for example Shanghai’s. Also, our boat was crowded with people which made it difficult to enjoy the cruise. 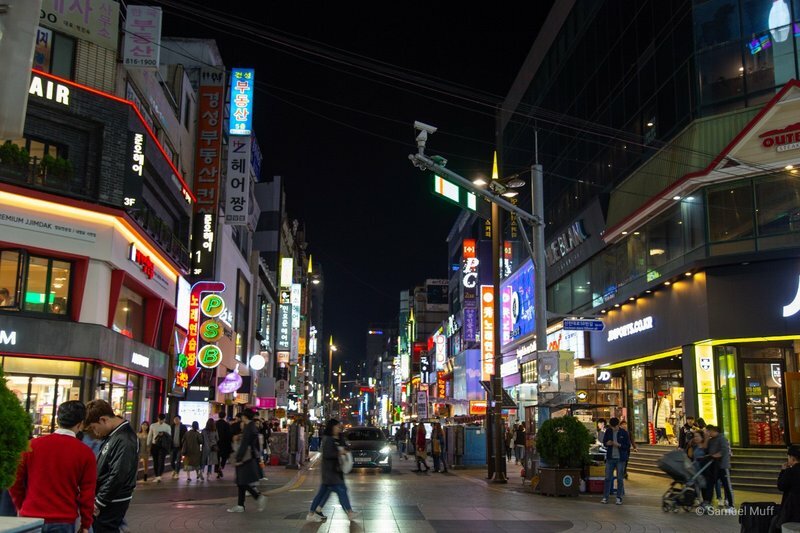 We came to the conclusion that every attraction in Seoul that costs more than 5$ is not worth it. There is an abundance of great sights in this city that cost little or nothing and one should stick to them. The next morning we took the train to Busan. 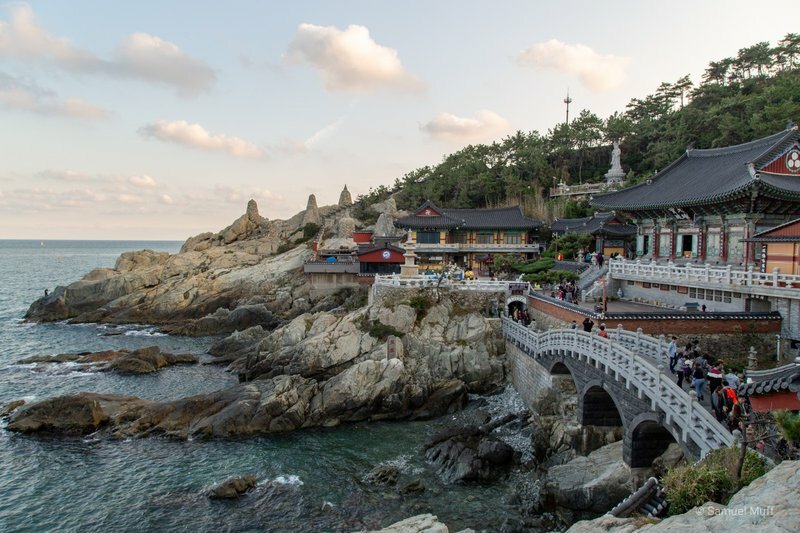 South Korea’s second largest city is located at the seaside in the south-east of the country. After more than 3 months of travelling, we witnessed the first sunset over the sea at Dadaepo Beach in the south of the city. 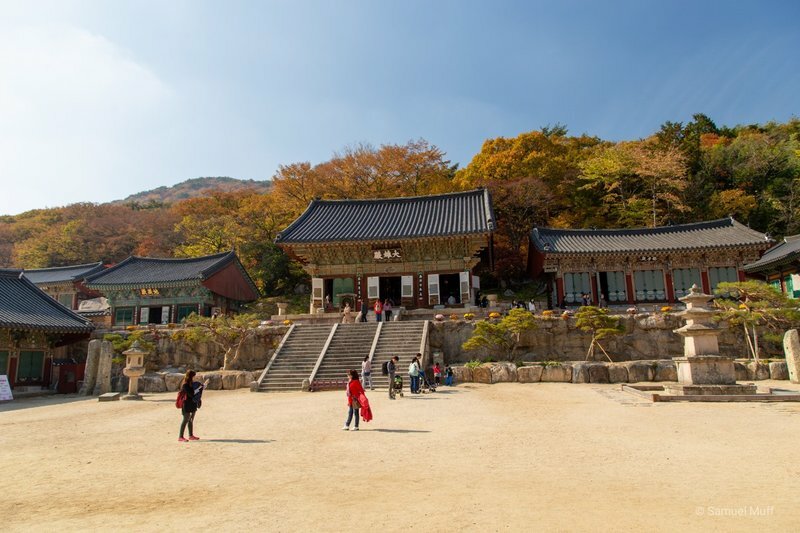 We visited some Buddhist temples on our last day in South Korea. 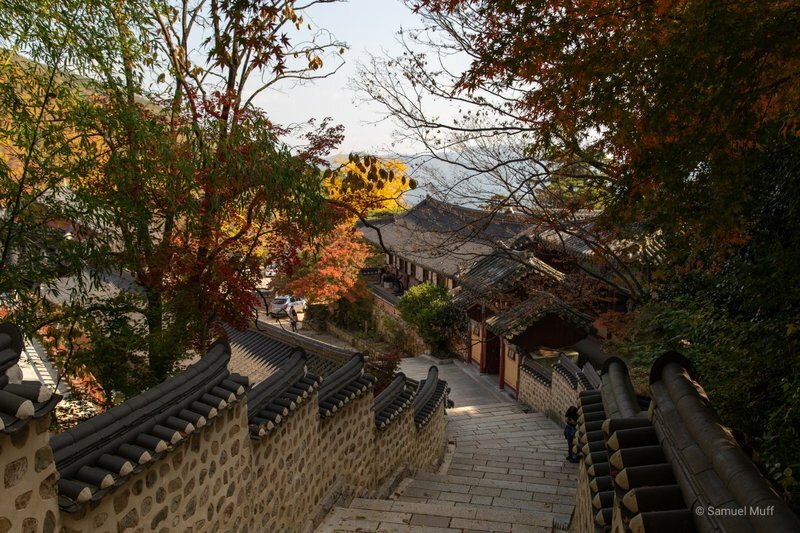 Beomeosa Temple was located on a hill amidst a colorful forest, whilst Yonggungsa Temple was directly at the seaside. In the evening we left Busan by ferry towards Fukuoka in Japan. Travelling by ferry proved to be much more comfortable than by airplane or by train. We had a reasonably sized room with two proper beds. A boat also moves much softer and quieter than trains and planes, so we were able to have a really good sleep on the way to Japan.